I will hopefully have a bit more time to play and write over the next few weeks so we will see how we get on! The domestic season finished in December but our first placed finish meant we would be entered into the Caribbean Champions Cup for the fourth consecutive season. The past two years have seen seen us fair very well in this competition as we have reached the semi final stage on both occasions. If I have any hope of ever progressing the overall state of Grenadian football or of ever turning Mount Rich into a professional outfit then I am well aware that winning this competition (probably on multiple occasions) will be key. This knockout tournament starts in the initial round with 64 different club sides separated into 16 groups. Everyone plays everyone in their group just once, with only the top placed side progressing to the next round. As you may recall from my previous update we had been handed a fairly easy looking draw, as we were grouped alongside Helenites Sports Club (US Virgin Islands), Sporting Vereniging Juventus (Bonaire) and Racing Club De Riviere-Pilote (Martinique). 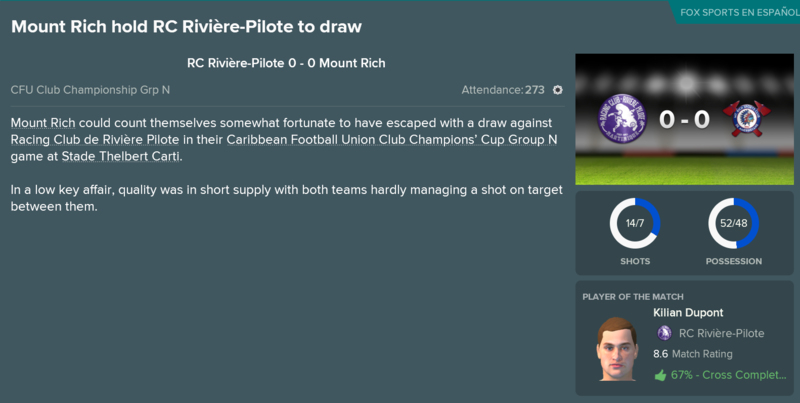 Not the most exciting of starts and we kicked off our campaign with a drab 0-0 draw against a strong RC Riviere-Pilote side from Martinique in a match played in Saint-Martin. The lack of match sharpness caused by me forgetting to schedule friendlies really showed as we demonstrated very little in the way of an attacking threat. As the game wore on our opponents looked the most likely to steal a winner as we tired towards the end of the match. There is not much to report on this one though, both sides struggled to fashion any real chances and in total we combined for just four shots on target. Whilst this result was not the most damaging I was well aware that it meant we would need to pick up wins in our remaining two fixtures to ensure we still had a chance of qualifying. We travelled to Puerto Rico for a clash with Bonairean champions SV Juventus for our second group game. After the poor result in our first group game we were lucky to come away with a victory in this one! We actually fell behind early after one of SV Juventus' teenage international stars smashed home a strike after his freekick had been blocked by the wall. I am not sure why, but that goal seemed to spark us into life and we pilled on the pressure throughout the remainder of the game. Still, all our pressure looked to be counting for nothing as our finishing was beyond embarrassing. Eventually we got back on level terms in the 54th but we did hav to rely on some fortuitous circumstances. SV Juventus failed to clear a corner properly and a game of pinball ensued which was eventually ended when young Benin defender Moukaram Abidjo tapped in from very close range. 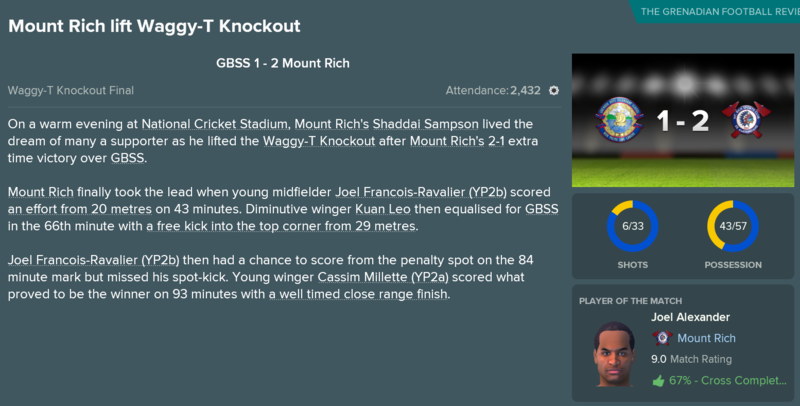 I knew a draw would likely not be enough to ensure our progress to the next stage so I went all out attack for the final half hour and, just as hope seemed to be fading, our emerging superstar, Joel-Francois Ravalier smashed home a close range finish in stoppage time to gift us a deserved winner. Our final tie saw us travel to Sint Maarten to take on US Virgin Island minnows Helenites. I was well aware that not only did we need to win this game but, since we drew our opening game, that we needed to win by as many goals as possible given that goal difference could become a factor when determining who progresses. We absolutely dominated this game from the outset and I still have no idea how we failed to score just three goals. We took the lead midway through the first half when Joel-Francois Ravalier scored his second of the tournament, firing home a powerful finish from the edge of the area. The second half saw a pair of substitutes further our lead. Firstly Shavon Bishop, who had only been on the pitch for nine minutes, slotted home a nice one on one chance just after the hour mark before young attacking midfielder Kyle Thomas tucked home a breakaway goal in stoppage time to ensure a three goal margin. Wow! 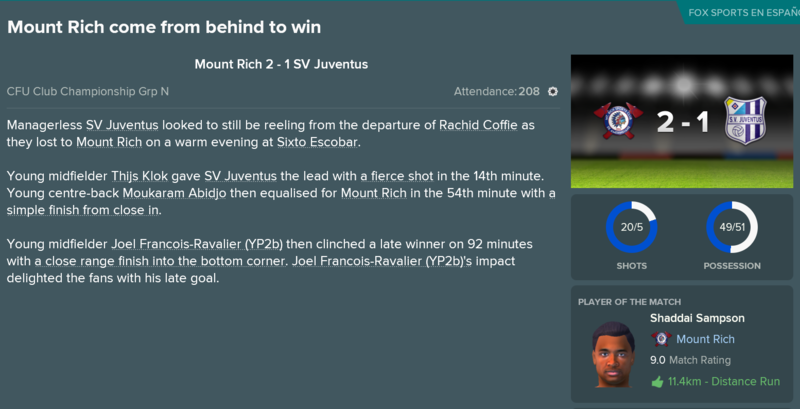 Amazingly for us anyways, SV Juventus smashed the side from Martinique by a 3-1 scoreline meaning we finish atop the group by one point. In the end, we finished as the only undefeated side and held the best goal difference so progressed through to the final group stage daily comfortably. In the next stage, the 16 group winners are placed into four groups and the tournament follows exactly the same format as this round. Speaking of, the draw for the final stage was made almost immediately after the conclusion of this one and we received some tough looking games. We are not getting out of this group - no way! All three of these sides are very good and we are going to find it very tough to top this group. I am not even sure how to rank these sides as I genuinely do no think there is an easiest game here. If I had to pick one that I am least scared about playing it would probably be San Juan Jabloteh Sports Club. These guys have won the top division of Trinidad & Tobago on four separate occasions and also have a CFU Club Championship title to their name, having won this competition back in 2003. Most recently they finished as runners-up in this cup in 2017 and, whilst they have a good squad, it is not one that I think is going to hammer us. Secondly we play Harbour View FC of Jamaica. This professional side have also won the top tier of their nation on four different occasions but they have two CFU Club Championship trophies to their name, won in 2004 and 2007 respectively. Their squad is made up almost entirely of Jamaican nationals but is way better than our own and I know this game is going to be a tough one. Finally we play a strange Puerto Rico FC. This side are based in Puerto Rico but play their club football in the United States league system. Domestically they have not won anything of note but they are the current CFU Club Championship holders, having won the title last year! This trophy meant they actually played in the CONCACAF Champions League earlier in the calendar year, eventually being knocked out by Philadelphia Union of the MLS. Their squad is insane and filled with foreign players, including two Englishman in the form of Bradley Halliday, formerly of Cambridge and Brennan Dickerson who lost recently played for Colchester. We again play each of these sides once, with only the top team progressing into the semi finals. I will be genuinely amazed if we can get through this group but stranger things have happened in football! We were not the only Grenadian representative in the Club Championship, as last seasons league runner-up Happy Hill were also involved. Unfortunately, our compatriots gave a pretty poor accountant of themselves despite a very weak group. They waged to beat a terrible Beaches FC from The Bahamas but then managed to convincingly lose their other two games against Marigot (Saint-Martin) and ASC Le Gelder (French Guiana) respectively. Although we have qualified for this tournament four times in a row, we have had four different sides from Grenada join us in each season. ideally, as we progress and develop, I need another side in Grenada to do the same and hopefully we would have a small chance of then seeing two teams from our nation progress into the final group stages. There is nothing much else to report on through the early part of this month but I will be back shortly with an update on the final group stage. Do we have any chance of escaping the group of death or are we looking at failing to make the semi finals for the first time in three years. Thanks for all of you who have picked up this story again following its resurrection. Hopefully I will be able to keep on top of things this time around and I can give everyone a detailed story! Having recently progressed through the initial group stages of the CFU Club Championship, we entered the business end. The final group stages see the 16 group winners separated into four groups before games against one another determine a single side who progress through to the semi finals. Right, lets get into this. We had three games knowing that we needed to finish atop the group if we were wanting to make a third consecutive appearance in the semi finals stage. First up, no biggie, the reigning champions Puerto Rico FC! 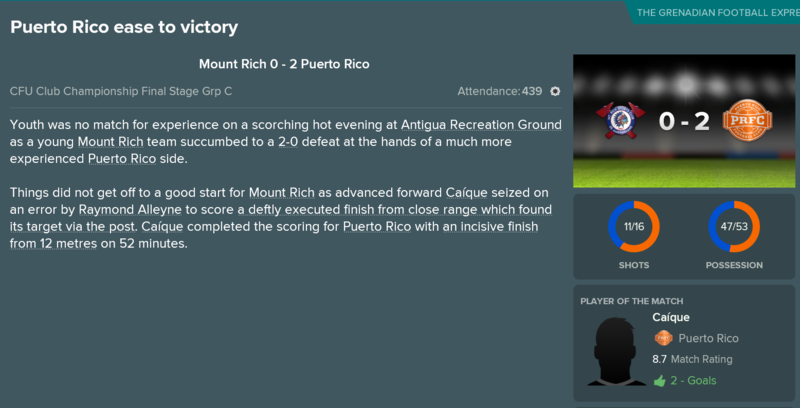 This game was held in Antigua and, despite falling behind after just four minutes, we gave a fairly good account of ourselves. We got off to the worst start possible when central defender Raymond Alleyne played a horrendous early back pass that was seized on by Puerto Rico's Brazilian forward. The same forward scored an early goal in the second period to ensure that the result was never in doubt. We did manage to fashion a few chances and were not outplayed in terms of possession. Young central midfielder Alistair Rennie had a very good game in the centre of midfield for us and his ball winning ability was a team highlight. Jamaica played host to this one and any hope of us qualifying was lost as we suffered a pretty crushing defeat. We were two goals down before the half hour mark as our Trinidadian opponents dominated play and attacked with ease. We did manage to grab a goal just before the half as Shaddai Sampson scored with a planted header following a good cross from young fullback Cassim Millette. We tried to play more attacking in the second half but found ourselves completely outclassed and Jabloteh capped a fine performance with a third goal late on to consign us to another defeat. I knew this group was going to be tough but I had pegged this fixture as the easiest of the three... how wrong was I? Our final game against Harbour View saw us playing predominantly for pride and we ended up leaving with almost none intact. Our Jamaican opponents dominated from the outset and controlled possession as they created chances at will. How we only conceded two goals I will never know as succumbed to 24 total shots against. In fairness, Nigerian shot stopper David Ibex actually had a fairly solid game for us and he is solely responsible for keeping this scoreline respectable. So, unsurprisingly, we failed to win a game and were duly dumped out of the competition. Reigning champions Puerto Rico FC look dead set to win another CFU Club Championship after they progressed to the semi finals as group winners. Not a very good tournament for anyone really. The best players though were easily Cassim Millette (7.38) and Joel Francois-Ravalier (7.30). The two youth academy products have developed into superb players and that showed as they looked very comfortable playing against proper opposition. Millette collected 15 key passes from his right fullback position as he showed off his attacking talents whilst Francois-Ravalier was the clubs top scorer at the championships, netting twice from his central midfield position. Shaddai Sampson (7.00) had a fairly good tournament but he only found the back of the net once. Goalkeepers David Ibeh (6.97) and Marc Walcott (6.90), who spilt shot stopping duties, both played pretty well and are probably responsible for us not getting hammered by some bigger scorelines. Surprisingly, Puerto Rico FC lost their semifinal game on penalties to Central FC of Trinidad & Tobago; who themselves then went on to win 4-1 in the final and secure their third CFU Club Championship win. Keron Neptune scored an outrageous 15 goals in just seven appearances for the champions, including five in one game during the initial stages! I am pleased Puerto Rico FC didn't win this one. The fact they are allowed to play in the USA league system but still enter the tournament vexes me a little so it was good to see a 'true' Caribbean side emerge victorious. I have not done much of an update for a while regarding my makers abilities. I have recently competed my National A Licence though and will look to get started with the Continental qualifications as soon as possible. In terms of managerial skills, this new qualification has not done much. I am still very average in terms of ability but I am slowly developing and hopefully I will start attract job offers from elsewhere soon in the future. My personal reputation is now at two stars (40% on the scale) and I am currently employed as an international manager so maybe I might be outgrowing Grenada? Unfortunately that is the end of Mount Rich football for a while now as we have to wait until July for the domestic season to restart. 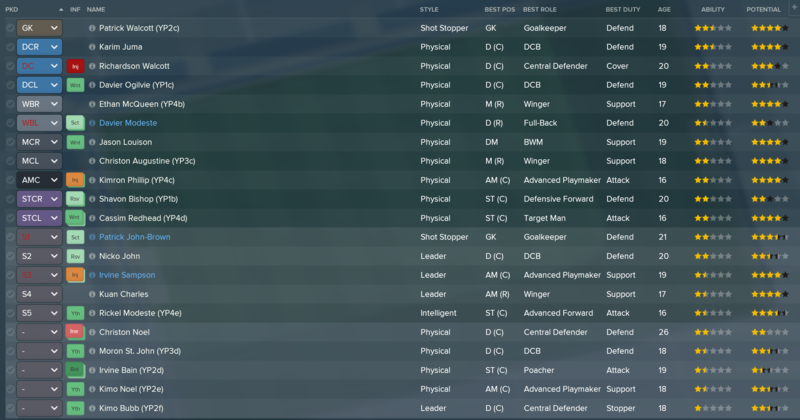 I am once again expecting to dominate the league and cup competitions and I have to start wondering if I will ever be able to develop a strong enough side to compete in the Caribbean Championship or whether it could be time to try a new challenge? I woud genuinely love to turn Mount Rich professional, win the CFU Club Championship and get to represent Grenada at the CONCACAF Champions League but that, genuinely, looks to be an impossible task - or at least one that would take me a very very long time to achieve. What do you guys think? Would you like to see me continue to improve Grenadian football or would you like me to try something new, possibly another Caribbean nation or a move to somewhere else on the globe? 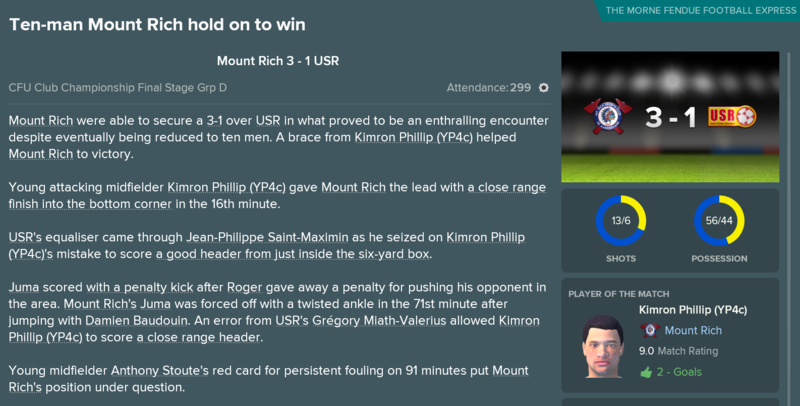 I think that Mount Rich must live up to it name. Dominate the Caribbean, however, it’s your save and your writing style will make whatever the choice, an entertaining read. I think it's your own choice really, do you like Genada enough, to push the league to great hights? Haha, that is very true! I would love to dominate the Caribbean, I just do not know if it will ever be possible to compete with the top Jamaican and Trinidadian sides as they are just so far ahead of everyone else at the moment. I literally had no affiliation with Grenada at the start of this save but I have definitely begun to develop a liking for the club and the players. I have got a fair few strong youth prospects come through in recent years and it has been a lot of fun watching them grow at Mount Rich and on the international front. Our early exit from the CFU Club Championship means that I now have a little wait until the Grenadian domestic season kicks off. I thought I would take that time to introduce you all to James Yates' other current managerial job. If you have read through the yearly recap updates you will be aware that I took the opportunity to enter international management as a bit of a side project and so far it has proved to be fairly successful. Welcome everyone to my second managerial role, leader of the senior national team of Kenya. Kenya is an East African country located on the equator and bordered by Somalia, Tanzania, Uganda, Ethiopia and South Sudan. They have a population of around 37 million people and the main languages spoken are English and Swahili. The senior Kenyan side have been partaking in international fixtures since 1926 but the current governing body was not formed until 1960. The national stadium is the all-seater Moi International Sports Centre, which has an outrageous capacity of 60,000. It was built in 1987 as a home for the All-Africa Games, an athletics competition, but is now used by various sports including football and rugby as the national stadium. Kenya have three main rivals, Tanzania, Ethiopia and Uganda, with the later seemingly a bitter rivalry as we have a listed derby game with them! Since Kenya are members of the CAF (Confederation of African Football) and the CECAFA (a sub-confederation of CAF that has jurisdiction in Central and East Africa), they actually participate in quite a few international competitions. The first one that I got to experience was the Total Africa Cup of Nations. Hopefully most of you would have heard about this competition before but it is essentially the premier international competition in the nation of Africa and takes place every two years. It is a pretty straightforward tournament, consisting of an initial group stage wth 24 teams followed by a knockout format working from a last-16 down to a final. Kenyan history in the Africa Cup of Nations does not make the best of reading. Since 1962, the national team have only qualified for this tournament on six occasions but, in-game, they did manage to make the most recent 2019 tournament. Unfortunately, they lost all their group games and were knocked out in the opening round, which was unsurprising given that they have never made it past the group stages in their history. 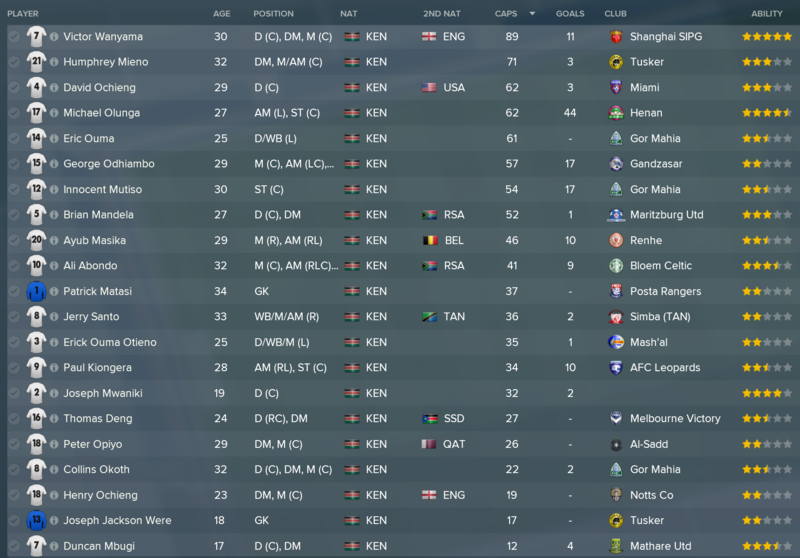 When I joined the national team, the qualifiers for the Africa Cup of Nations 2021 had just begun and amazingly, I managed to put together some pretty good performances and qualify. We finished in 2nd place, behind a very strong Democratic Republic of Congo side but ahead of our fierce rivals Uganda. This fine performance meant we would qualify for our seventh appearance at the Africa Cup of Nations. We will again play Democratic Republic of Congo having faced them in the qualifying rounds but we also draw Tunisia and Gambia. I will take a look at these teams in more detail once the competition actually gets around to starting but all three are currently ranked higher than us in the World Rankings. The second competition that I got to experience was the CECAFA Senior Challenge Cup. This tournament seems to take place yearly and is competed over by the 12 best national sides from Central and East Africa. Teams are placed into an initial group with the winners progressing to then compete in a semi-final and a final. It is quite a fun tournament in that it consists of some of the lesser known African nations. If you read my previous update or check out the screenshot above you will notice that we actually managed to win this competition last year! 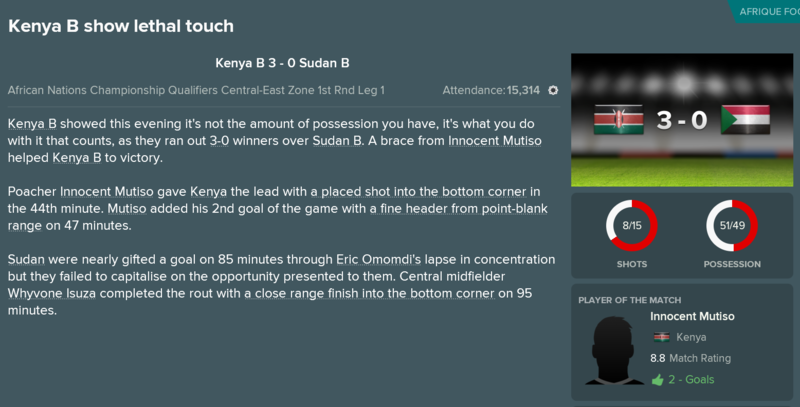 We defeated bitter rivals Uganda in the final courtesy of penalties and this meant I won my very first piece of international silverware! The final competition that I have only recently started playing is FIFA World Cup CAF Qualifying Section. Kenya have never qualified for a World Cup before and it would be an amazing achievement to guide them to 2022 tournament set to be held in Australia. 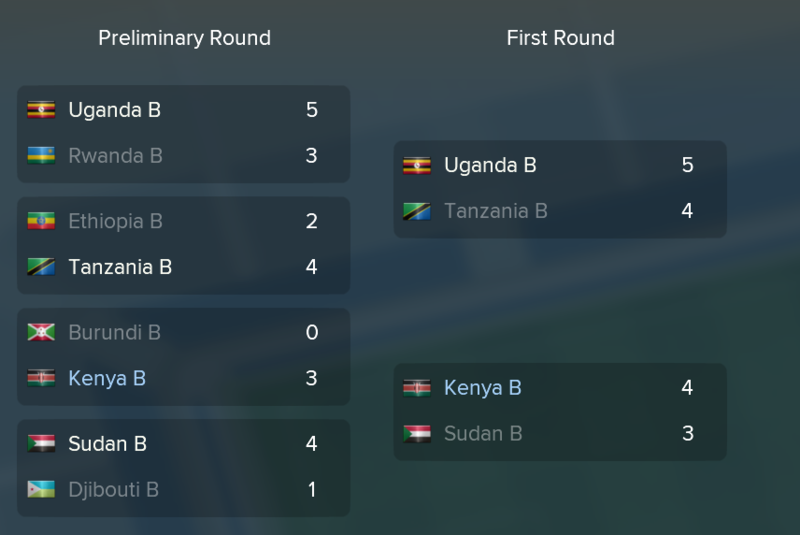 The qualifiers for the African section consists of two knockout rounds, both of which had been completed before I joined. Due to our ranking we entered in the second round where we defeated Mozambique in a two-legged tie to progress to the group stages. 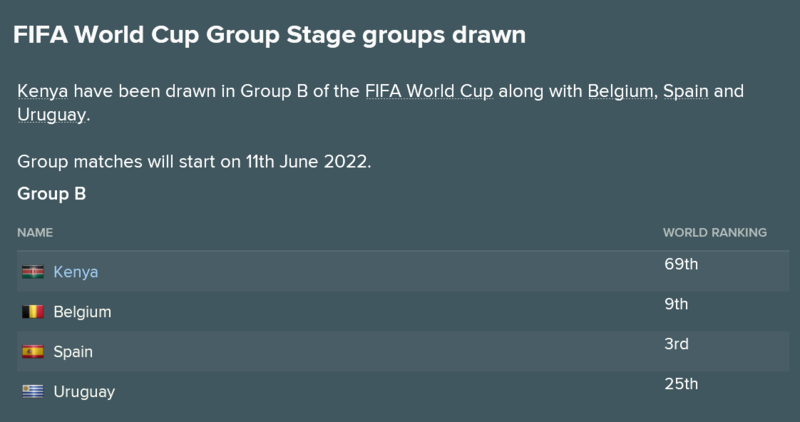 The group stages are very simple, five groups of four with everyone playing each other twice and the top placed team from each group qualifies for the World Cup. We are in a group with Egypt, Benin and Liberia and somehow we lead the way after just two games. 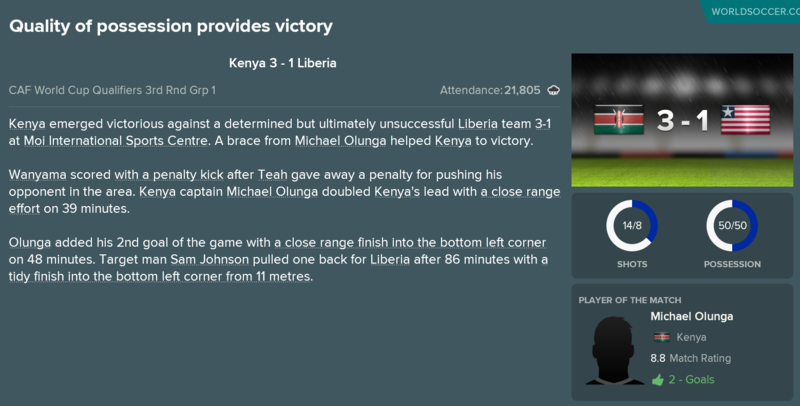 We defeated Liberia in our opening fixture, playing out a crazy 4-3 away win before we picked up a remarkable 1-0 victory over Benin at home. 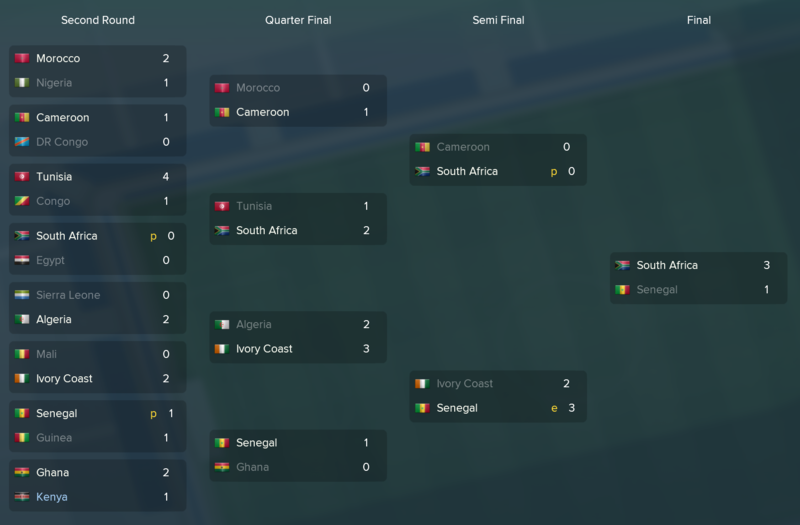 Obviously the main threat here is Egypt (who we still have to play twice) but they gave us a glimmer of hope as they lost their opening game against Benin... somehow. The next round of these games takes place in September, where we face a very tricky two games with a home game against Egypt and an away tie with Benin. Domestically, Kenyan football is not anything to get excited about. There are a few professional clubs but the Kenyan Top League is not amazing, despite a number of the squad playing their club football there. In terms of the national side, their highest ever national ranking was 68th (back in 2008) but when I joined they had slipped down to 107th. A few poor performances early on saw us drop even further, reaching a low of 121st but recently we have been on the climb and a good showing in the CECAFA Challenge Cup and some good results in the World Cup qualifiers mean we are now ranked 86th. How many of you can name five Kenyan players? I would have been very impressed because I certainly could not have before I arrived. I imagine most of these players are fairly unrecognisable to most of you but there should definitely be one at least who rings a bell? The standout, by an absolute mile, is Victor Wanyama. The central midfielder, formerly of Tottenham, moved to China on this save but is without a doubt the best player in this squad and, arguably, the best player to have ever represented Kenyan. Wanyama is 29 years of age on this save now but has racked up 78 international appearances. He needs to surpass 105 in order to become the most decorated player in his countries history, a feat I think he can easily achieve providing there are no setbacks. In goal we have a trio of very poor keepers. Patrick Matasi is probably the best but he is now 33 years old and definitely coming to the end of his career. One player I have been impressed with is newgen stopper Joseph Jackson Were, who at just 17 years old, looks to be a good future prospect between the sticks. Defensively, the most capped player here is central defender David Ochieng. The 28 year old plays in Miami and has recently surpassed 50 international appearances. He is supported at the back by another veteran in the form of vice captain Brian Mandela, a 26 year old who plays his club football in South Africa. One prospect that I am excited by is young Joseph Mwaniki, an 18 year old newgen who plays in Kenya but is already becoming a vital first teamer. Our midfielders are fairly strong. Alongside Wanyama I have been impressed with both Ali Abondo and Peter Opiyo but both are in their thirties and on a bit of a decline. One youngster that I like a lot is Henry Ochieng, a 22 year old who plays for Leyton Orient in England, and operates in more of an attacking role alongside Wanyama. Up top we have a fairly good striker in the form of Michael Olunga. The 6'3" target man plays his club football in China but has recently become the joint highest scorer in Kenyan history with 32 goals. He is still only 27 years of age so he will easily better that record and he has become a real focal point for our attacking tactics. So that concludes my little update to Kenya. I will be back with an African Cup of Nations update for these guys when that tournament gets kick started in the summer. I hope everyone reading does not mind me running a bit of an international focus alongside my Mount Rich work, it just gave me something else to focus on and I have really enjoyed being in charge of Kenya thus far! Welcome back to my save where we are currently in the offseason in Grenada and awaiting the start of a new domestic campaign. In the meantime, I do have an update for you and it is from my international post where, if you recall, I had guided Kenya to the African Cup of Nations. This update will include all information from the premier national competition of Africa as well as detailing our specific progress. The 2021 Africa Cup of Nations is held in the Ivory Coast and the reigning champions are Cape Verde who, surprisingly, failed to qualify for this tournament meaning there will definitely be a new winner come the end of the championship. The format for the cup is fairly straightforward. We begin with six groups, containing four teams, where everyone plays everyone once. The top two sides from each group progress to the Second Round (the last 16) alongside the best four 3rd placed sides. This means that only eight of the starting sides are eliminated in the group stages. From there the tournament follows a regular knockout format with extra time and then penalties being used to determine a winner. The draw for the groups stages had already been completed and we were drawn in Group B alongside Democratic Republic of Congo, Tunisia and Gambia. Of these three sides, the weakest (although they are still ranked higher than ourselves) is Gambia. Nicknamed The Scorpions, Gambia are currently ranked 72nd in the world and have a fairly decent squad but are without any real superstars. One of their better players in attacker Modou Barrow who currently plays for Reading in the English Championship but they also have £6m-valued forward Yusupha Njie from Nancy in France. Tunisia are actually ranked below Gambia, currently 76th, but they have a far superior squad in terms of talent. This is a nation who have qualified for the World Cup on five different occasions and one who won this competition back in 2004. Again, they do not have any superstars but they have some very talented depth. Their best players are probably Burnley attacker Wahbi Khazri, who has 16 international goals in 81 appearances and Valencia central defender Aymen Abdennour who is two appearances away from 100 caps. Last but not least we have Democratic Republic of Congo. We played these guys in our qualifying group, which they topped after going unbeaten, and they are the highest ranked side we will face in the opening stage, currently sitting at 40th in the world. They are led by £50m rated forward Cedric Bakambu who is currently with Chelsea alongside Newcastle midfielder Chancel Mbemba and fullback Arthur Masuaku who is now with Arsenal having previously played at West Ham. One additional player to watch is Chancel Mbala, a 19 year old newgen currently at Bayern Leverkusen. The teenager has already collected 16 senior caps and my scouts reckon he is already one of his nations best players. A fairly straightforward selection for me given the lack of depth we have in the national player pool. There was a recall for experienced midfielder Humphrey Mieno, who missed the last round of games through injury. We will likely be relying heavily on our two China-based stars in Victor Wanyama and forward Michael Olunga if we are to stand any chance of qualifying from this group. Attacking midfielder Ali Abondo and central defensive pairing Brian Mandela and David Ochieng are probably our next three best players. I named a pair of teenage newgens in the squad in the form of goalkeeper Joseph Jackson Were and talented centreback Joseph Mwaniki. There was also a place for young England-based midfielder Henry Ochieng who has recently joined Notts County. So we would have three group games to attempt to grant ourselves qualification to the second round, a feat that has never before been achieved in Kenyan footballing history. We were aiming for a third place finish at least, as this would give us a chance at going through due to the best loser ruling. We opened our group with probably our toughest matchup and came away with an absolutely outstanding victory! Despite the strength of our opposition we were able to hold our own and although DR Congo created more chances and held more possession we defended resolutely and limited their strong attacking threat. At the other end, target man Michael Olunga looked a threat throughout and he opened the scoring early on with a superb header following a cross from strike partner George Odhiambo. Things got even better for us when Olunga grabbed his second, another header, just before halftime. On this occasion the provider was fullback Jerry Santo, and his clipped cross was slammed home at the far post by our rangy striker. DR Congo did hit the post early in the second half but we managed to restrict them well as the 45 minutes progressed and their final good chance fell to Middlesborough forward Britt Assombalonga who blazed over from the edge of the area. This was an all-around great showing and one that kick started our Cup of Nations journey in the best possible way! Michael Olunga's man of the match performance was capped off by the news that his goals had meant he had become the all-time top scorer for Kenya. Game two saw us face another tricky test against a solid Tunisia side and, after our heroics in the opener, we crashed back down to earth with a comprehensive defeat. We had defended so well against DR Congo but we just could not maintain those levels in this one and we allowed a whopping 30 total shots at goal as Tunisia dominated possession. Two quick goals just before the interval looked to consign us to defeat but poacher George Odhiambo netted early in the second half, albeit against the run of play, to give us a chance at claiming an underserved draw. It was not to be unfortunately as forward Issam Jebali, who plays his club football in Holland with Vitesse, netted his second soon after and put the game out of reach. I knew we would definitely need to play better than we did i this one in our final fixture if we were to have any chance of making it through to the next round. YES! Another win, although one that we had to work very very hard for. 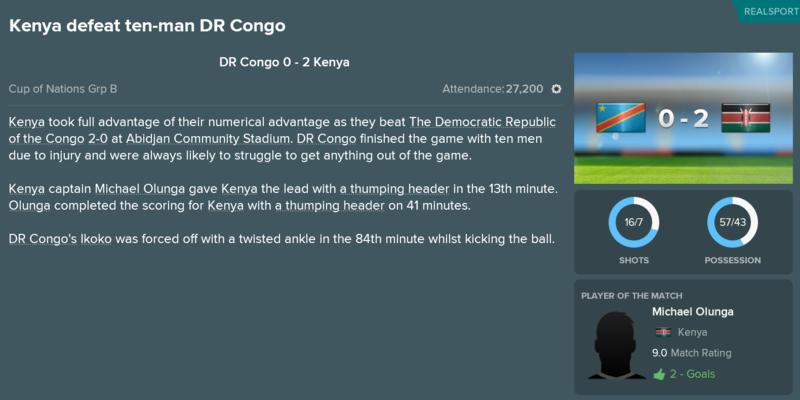 Gambia had drawn their previous game with DR Congo and so we both entered this game knowing a positive result would likely see us through to the next round. Unfortunately, our opponents looked the brighter of the two sides through the opening exchanges and they took the lead when Ousman Manneh, who plays in the second tier of Germany, tapped in from close range. Things almost turned disastrous for us in the 11th minute when Manneh was adjudged to have been just offside after the ball ended up in the back of our net. Despite these early scares we grew into the game and were level in the 21st minute when forward Innocent Mutiso let fly from outside the box. The 30 year olds strike was so good it has got to be up there for Goal of the Tournament, as he smashed the ball into the top corner of the net. The second half saw both sides create chances to win the game. Ousman Manneh, who was a terror for our backline all game long, crashed a header against the bar in the 75th minute whilst for us, Victor Wanyama placed a delicate shot just wide of the post with about 10 minutes to play. Then came the drama of the last few minutes. We were awarded a penalty in stoppage time after a foul on fullback Erick Ouma Otieno and up stepped captain Michael Olunga. The rangy forwards tame kick was easily palmed away by the Gambian keeper and all hope of victory looked gone. The rebound however had fallen to Daniel Mzee on the right wing and the fullback whipped in a cross; who was there on-hand to tap the rebound home? Only Michael Olunga! A crazy few minutes for the forward but one which ultimately meant we claimed our second victory. That final victory meant we were through to the second round as group runners-up. Tunisia lost their final game to DR Congo, meaning both those sides would be in the last 16 alongside ourselves. Speaking of the Second Round, the draw was done immediately and we did not receive an easy matchup. So we were drawn against Ghana, the second highest ranked side in the competition and one who had topped their initial group easily, going undefeated. They are obviously a very good side, with outrageous depth at all positions, but they do not have the superstars they once used to. Their best player is probably Thomas Partey, the defensive midfielder who now plays for Atletico Madrid. Also in their squad is former Chelsea fullback Baba Rahman and the Ayew brothers, Jordan and Andre, who are still both playing in the English Premier League. If, by some miracle we were able to get past Ghana we would face a tie with either Senegal or Guniea, with he former being the highest ranked side in the competition. Ugh, we gave a good account of ourselves but ultimately it was not enough. To be fair, this was probably the best we have played in this competition. We kept the ball pretty well, sharing overall possession numbers with our opponent, and created enough chances to keep the game interesting. It was always going to be difficult to keep out a side of Ghana's ability and we went behind midway through the first period when Jordan Ayew crunched home a header. Although we played well we did struggle to create clear-cut chances in the first period and early in the second half. Unfortunately, we fell to goals behind after 69 minutes when the other Ayew brother, Andre, scored himself a headed finish. This second goal actually sparked our best period in the game and the final twenty minutes saw us play some really good football. Michael Olunga saw a one-on-one chance parried away and Victor Wanyama had an excellent angled finished tipped over the bar. This pressure eventually led to a deserved goal, albeit one that was too late to affect the scoreline. Jerry Santo played a nice cross which was headed down by substitute Paul Kiongera into the path of George Odhiambo. The experienced forward then rattled a first time strike across the goalie to give us a consolation. I was very happy with our performance in this one and, with a little bit of luck, we could have come close to causing an upset! No huge shocks here but I guess South Africa winning was a bit of a surprise. They had a very fortunate run to the finals beating both Egypt and Cameroon on penalties but they played excellently in the final and came away with a 3-1 win against favourites Senegal. Elsewhere Nigeria failed to make it beyond the second round and host nation Ivory Coast almost made it to the final but lost to Senegal in extra time. I was a bit disappointed to not see ourselves listed as the tournaments biggest overachievers but fair play to Sierra Leone who made the Second Round despite being ranked below us. Vincent Aboubakar was on fine form for Cameroon and his six goals almost saw him guide his side through to the final. So that concludes what has been a rather thrilling Africa Cup of Nations. 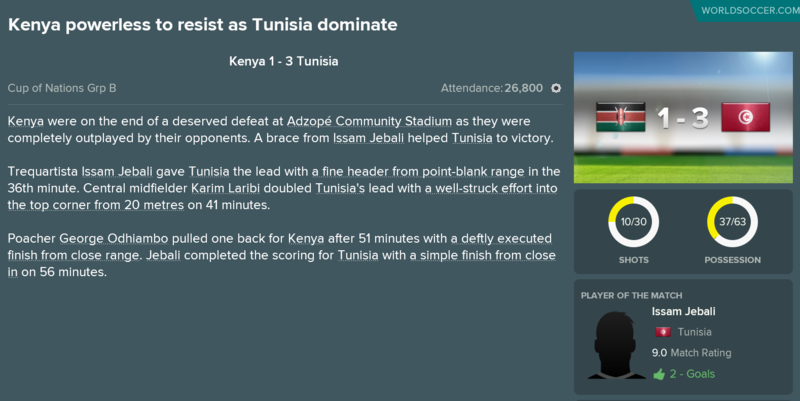 For the first time in their history, I was able to guide Kenya through to the Second Round where we came fairly close to causing an upset against a strong Ghanian side. I think I will stay at Kenya for a little bit longer as I would like to finish a World Cup qualifying campaign. We won our first two qualifying games which means we have a chance, albeit a very very small one, of qualifying for the 2022 World Cup - which would be an absolutely monumental achievement. I hope you are still all enjoying this save and I will be back to Grenada soon as the start of the new domestic season draws near! I know I said I would be back with a domestic update from Grenada next but before I could get around to playing my Caribbean games, another international competition came my way! 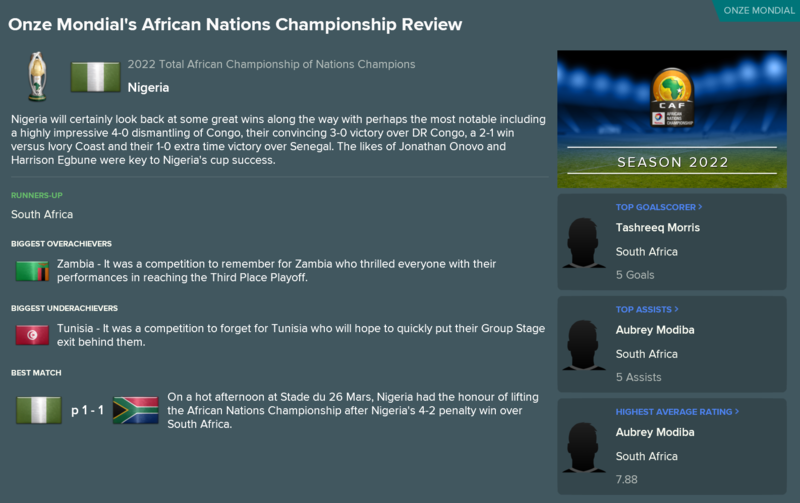 I had no idea that the African Championship of Nations even existed but it does, and we get the chance to qualify for it, starting with a preliminary round matchup this July. You are forgiven if you have never heard of this competition before because I'll be the first to admit that I definitely had not! The tournament itself is a fairly new one, with the first edition being played in 2009. It is run every two years, alternating with the Africa Cup of Nations. It is a fairly unique tournament in that the national sides that take part are only allowed to include players in their squad who also play in the domestic divisions of their nation. Any foreign based players, regardless of where they play and even if they are based in other African nations, are not allowed to participate. Apparently the competition was created to boost the reputation and strengthen the national competitions of Africa, which are regularly weakened by the mass exodus of players who leave their home nations to play for foreign based teams. It creates an interesting situation for ourselves in that our best players (Victor Wanyama, Michael Olunga etc) will all not be permitted to play since they do not play their club football in Kenya. I am also pretty sure that the Kenyan domestic divisions are pretty poor in terms of quality and therefore it will be a challenge to put together a competitive squad. Unfortunately we are not automatically entered into this competition and have to work our way through a regional qualification process in order to reach the finals, due to be held in Mali next year. We are drawn in the Preliminary Round of the Central-East Zone and have received a clash with Burundi. The game will be played over two legs (home and away) and if we win this tie we go through to the First Round. The two winners of the First Round games gain qualification to the finals in 2022 as representatives for the Central-east region of Africa. You will note the use of 'B' squads here but that is purely because I have to select a squad alongside the senior team, that fulfils the domestic-based ruling. Burundi are a team I have not encountered yet on this international adventure. Their senior side are not very good, currently ranked 159th in the world, but then again they do not have many foreign based players in their national set-up, meaning they will be at almost full strength for this game. A number of their players play their club football in the Top League of Burundi and they are led by newgen midfielder Kevin Nkurunziza, an 18 year old who already has 20 senior caps for his country. So this squad was a lot more difficult to put together than my previous one as it turns out a number of our usual players are based in foreign leagues, including other African leagues. The standard of Kenyan football is pretty poor and so there was not many players for me to choose from. We did manage to retain a few players from our senior squad. All three goalkeepers are the same players that I would name in a normal squad and developing newgen defender Joseph Mwaniki and starting left fullback Eric Ouma are both included. Forwards Innocent Mutiso and Paul Kiongera, both both played in the Africa Cup of Nations are also present. The rest are players that I would not usually consider for international selection. The best player is probably 32 year old central midfielder Collins Okoth who has won 13 senior international caps during his career. I have also included exciting newgen midfielders Duncan Mbugi, who is just 16, and Paul Otieno, who is 18, as the other available midfield players were all very poor. We have a few good defensive options in the form of Crispine Odula, Eric Omomdi and Musa Mohamed. Jacob Keli and Noah Wafula are solid attacking options but ones who I would not usually turn to. The Preliminary Round of qualification sees us take on Burundi in a two-legged affair with the winner progressing to the First Round. We kicked things off with a trip to Burundi for the first leg in front of a number 13,048 strong crowd. We never really got going in this one but did enough, backed by a strong defensive performance, to come away with an important away victory. We took the lead midway through the first period when Paul Kiongera combined well with Noah Wafula and smashed home a strike from inside the area. 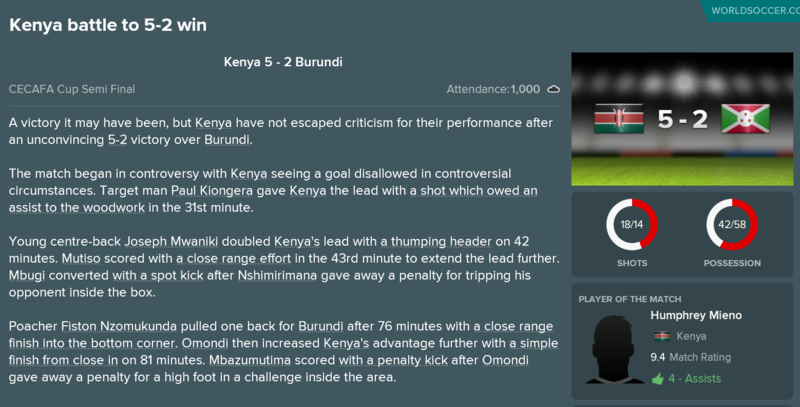 We should have probably scored more but Innocent Mutiso missed a pair of golden one-on-one chances in the second half meaning Burundi still have an opportunity going into the second leg in Kenya. We never really looked like conceding though, as we limited the opposition to zero shots on target and I am confident of progressing. Any early nerves were easily squashed when we were awarded a spot kick in the 3rd minute of the game following a push. Experienced central defender Eric Omomdi stepped up and confidently dispatched a right footed strike into the top corner of the net. We again created a number of chances but our finishing was lacking and, of our 15 total shots, only four hit the target. We did manage to seal the tie in the second half when Innocent Mutiso tapped home a header at the far post following a right wing cross. The experienced forward is one of the better players in this Kenya-based squad and his quality shone through in this one following a poor outing for him in the first tie. It was also good to see young Joseph Mwaniki named Player of the Match. The teenager is readily becoming one of the better players in Kenya and I cannot imagine it will be long until he moves abroad as he develops a reputation on the international stage. Victory in the Preliminary Round means we go through to the First Round (the final round) of the qualification process. This round sees us take on Sudan. Despite their current world ranking, this game will definitely be a tougher challenge then the one we experienced against Burundi. The Sudanese domestic league seems to be home to a number of pretty talented national team players and this side comfortably came through their initial tie against Djibouti. The game is due to take place in mid-August and so I will be back soon to see if we can qualify for another national tournament following our recent appearance at the Africa Cup of Nations. I hope this update gave enough information on how this competition runs, considering I had never heard of it prior to this save. I will be back soon to see how we get on in the First Round of the Central-East Zone and I really hope this international side quest is of interest to people as I am definitely enjoying this aspect of the save thus far. I promise this will be the last international update before I get back to what has been going on with Mount Rich in Grenada. 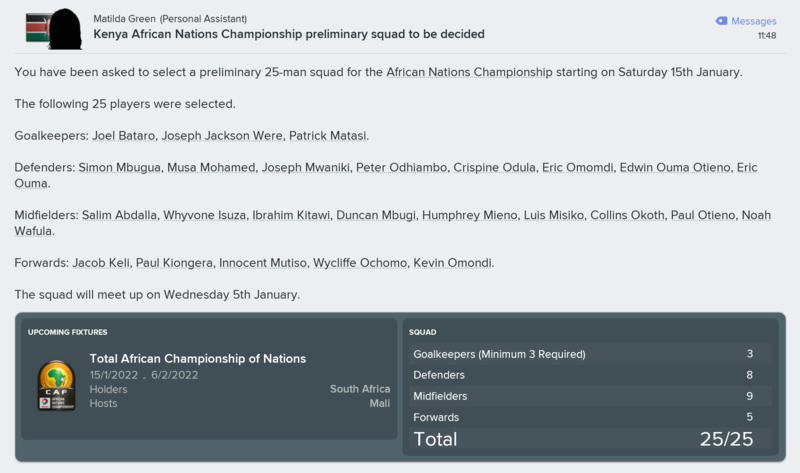 As you may have read in my last update, we found ourselves having to play some qualification games for next years African Championship of Nations, a interesting tournament which sees countries only allowed to field national players who participate in their respective domestic leagues - no foreign based players are allowed to play at all. This let us a little short of quality as the majority of our Kenyan stars ply their trade in the foreign divisions. Still, the Preliminary Round saw us battle through against a fairly poor Burundi side but in the First Round we were faced with a much tougher assignment. As you may remember, national sides are grouped geographically for the qualification aspect of this tournament which probably works in our favour as it means we avoid some of the more superior West and North African sides. We were grouped in the Central-East Zone of qualification and, as previously mentioned, battled through the Preliminary Round. 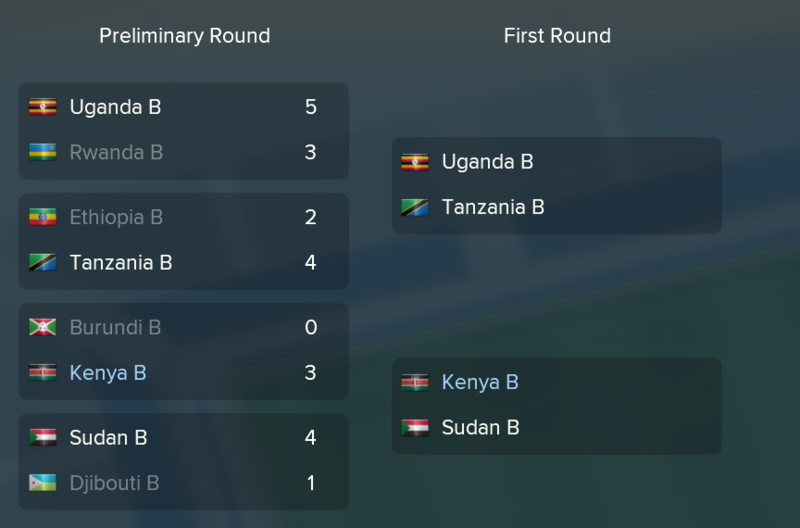 The First Round, which is also the Final Round, saw us face off against Sudan, with the winner qualifying for next years African Championship of Nations in Mali. Although the Sudanese national side is ranked 122nd in the world, a fair bit below ourselves, they have some pretty talented players who also play in their domestic league meaning they are eligible. They wee not too many changes in this squad when we compare it to the one I submitted for the Burundi game. One of the major news items is the return of midfielder Humphrey Mieno. 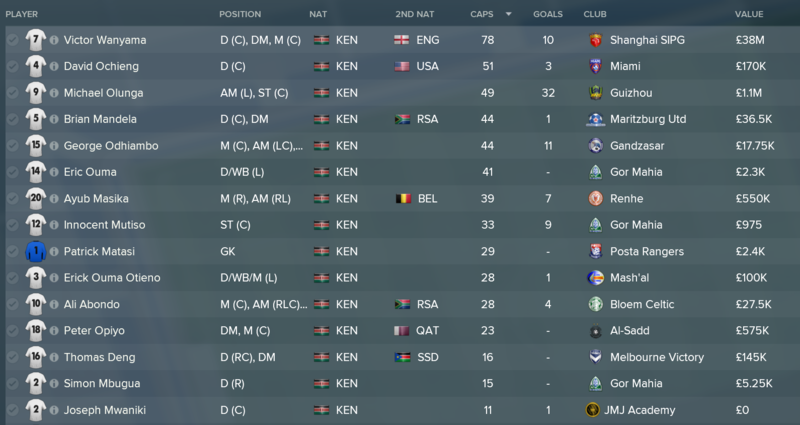 The veteran playmaker is a regular in my usual Kenyan squads, having racked up 58 career senior caps, but missed out in the last round of this process through injury. He will be a welcome addition in the middle of the park, which was probably the weakest area of our side last time around. The three young newgen players; goalkeeper Joseph Jackson Were, central defender Joseph Mwaniki and midfielder Duncan Mbugi, all return alongside senior national team forwards Innocent Mutiso and Paul Kiongera. Left fullback Eric Ouma is the only other player who would usually be considered for full international selection with the next best players likely being defensive midfielder Collins Okoth and veteran defenders Crispine Odula and Eric Omomdi. A two-legged, home and away, tie with Sudan was all that stood between us and qualification for another international competition. Could we do it?! This was a very good result first up! This leg saw us play out a match in front of a 15,314 strong home crowd and come away with a very important victory. Having lacked a clinical edge in the Preliminary Round against Burundi, our forwards showed their hint of class in this one as we converted eight total shots into three goals. The opening exchanges saw us on the back foot as the away side developed a lot of pressure but failed to create too many clear-cut opportunities. We took the lead, albeit against the run of play, on the stroke of halftime when Noah Wafula played a neat pass into forward Innocent Mutiso. The veteran striker swivelled cleverly and fired a placed shot into the bottom corner. Things got even better for us after the break as just two minutes into the second half we doubled our advantage. A poor defensive clearance fell to Paul Kiongera and his cross was met at the near post by Mutiso who glanced a header beyond the Sudan goalkeeper. My strategy then was to focus on preventing an away goal and we switched to a more counter attacking style. This definitely paid off as, not only did we limit Sudan to a scoreless day, we also collected an important third goal deep into stoppage time when young substitute midfielder Whyvone Isuza crashed home a first time strike following a squared pass from the superb Mutiso. A 3-0 scoreline meant we traveled to Sudan knowing that any positive result would see us qualify for another international competition. Woah. We made it very nervy but ultimately we were able to get through courtesy of a 4-3 aggregate scoreline. We started brilliantly and made things a lot easier for ourselves when experienced central defender Eric Omomdi headed home a free kick after just two minutes of the game. 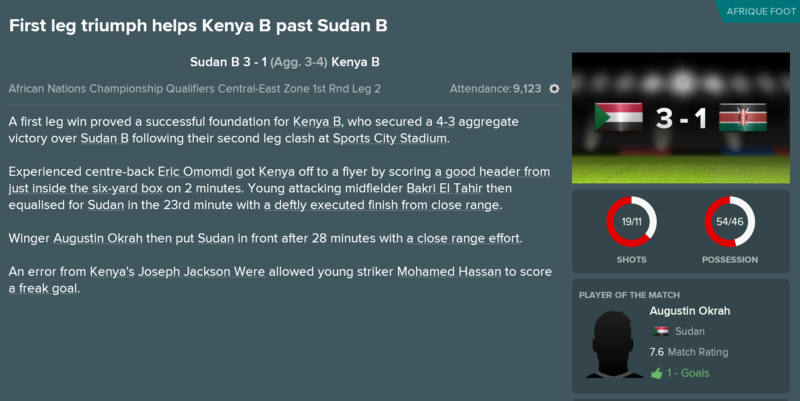 This away goal left Sudan needing a whopping five goals to have any chance of progressing and I was confident we could hold out. Still, we made things very difficult when two goals in five first half minutes turned the tie around slightly and gifted the hosts the confidence needed to go out and play the attacking style required. We had some decent chances in the second half to put the game to bed. We saw Noah Wafula hit the post with an angled strike and then moments later the woodwork was rattling again as Eric Omomdi powered another header against the bar. Unfortunately it fell to Sudan to score the next goal when, in the 70th minute, Joseph Jackson Were horribly misjudged a cross and let the ball loop over him into the back of the net. The hosts had twenty minutes to score two more goals but fortunately we held on and despite the poor result we would win qualification thanks mainly to our impressive home victory in the first leg. Victory in the First Round of the qualification process means we will be one of the 16 teams laying at the 2022 African Championship of Nations. This is a competition that the national side has never before reached in their history, so just reaching next years finals in an achievement in itself. Following our historical performance at the Africa Cup of Nations earlier in this calendar year, this is another on the list of positive accolades that I am mangling with Kenya. The Central-East Zone saw Uganda beat Tanzania in the other tie and our close rivals will therefore join us in next years finals. Elsewhere, some of the bigger names who did not make it through include Egypt, Algeria, Ghana and Cameroon so it looks to be an interesting tournament and it will be fun to see how the domestic-based only player rule affects the strength of teams. That concludes the qualification process for this tournament and the only key remaining international fixtures for this calendar year are the World Cup qualifiers that we are due to play. The next update will see me return to Grenada for the start of the domestic season there and I will run a short update detailing the current squad as it has been a few seasons since I went into proper detail regarding the players and youth products that I am now deploying. Thanks again for reading you guys and thanks for all the positive comments! do you have the Kenyan league running? 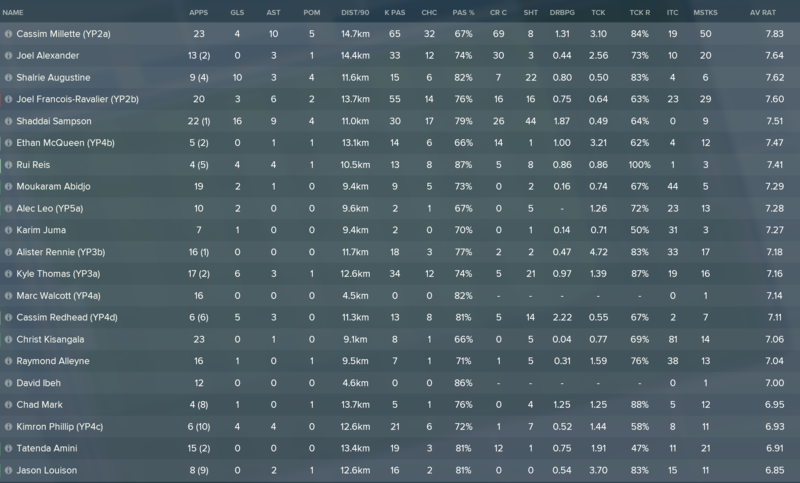 I do not have it running unfortunately but the main few domestic sides seem to develop a few youth products every season so the national team should not get too far left behind in the future. Having played through a number of different international competitions with the Kenya squad, I will now be returning to Grenada and to Mount Rich. I have been crowned league champions in three of the past four seasons as well as winning the domestic cup for four consecutive years. 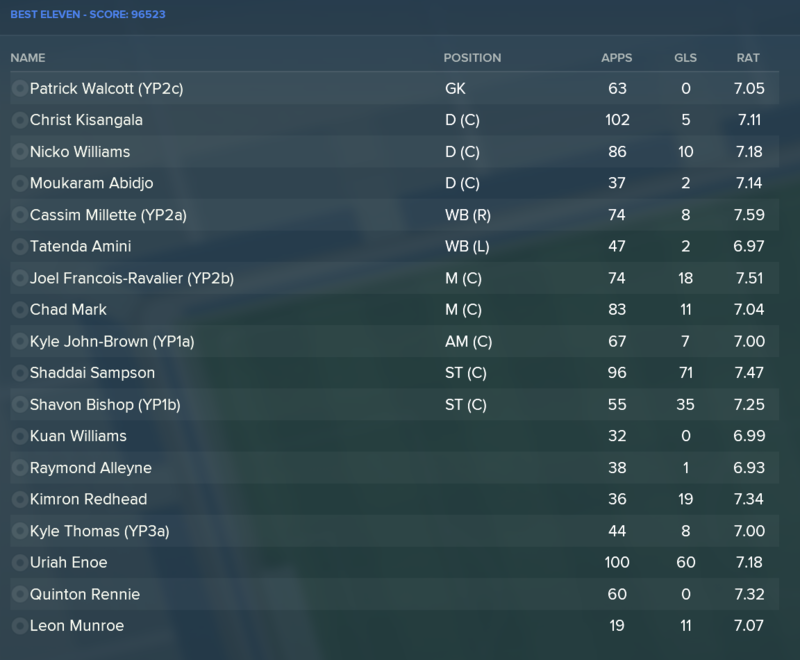 I realise that I have not detailed what the Mount Rich squad looks like for a few years now so rather than just covering this preseasons transfer activities I will instead take a bit of a more in depth look at the players that have made us the most reputable side in Grenada. I will kick things off by taking a quick look at the financial side of things. In terms of general money, we are easily the most wealthy club in Grenada with an overall balance of around £300,000. Although this is fairly impressive for a part-time club, it still is not enough for the board to consider turning professional or approving any training facility upgrades. Our positive overall financial outlook has resulted in some very healthy budgets being handed out this year. Both of these figures are the highest that they have ever been in my career. 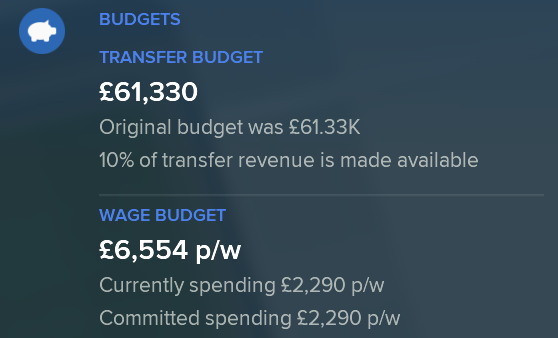 The transfer budget, although impressive, is a figure that I do not pay much attention to given that I am not really in the business of buying players. 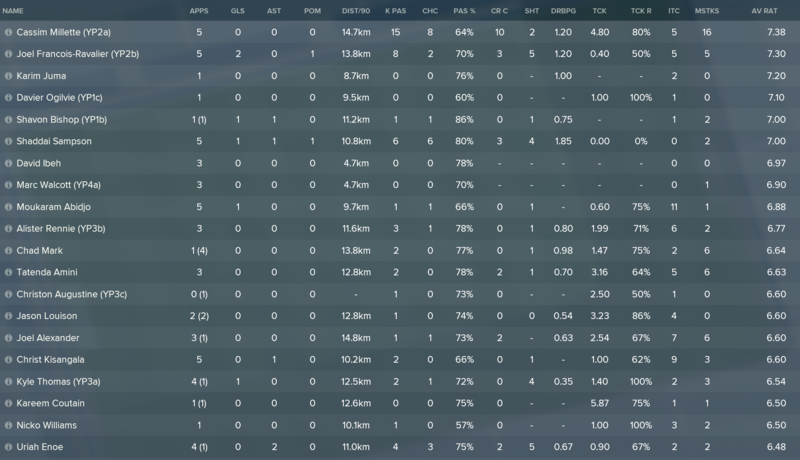 The wage budget however, has proved very helpful in allowing me to retain my best players by offering them new, lucrative contracts when foreign sides come sniffing for their services. Unsurprisingly, the board are well aware that we are the best side in the country and therefore, at a minimum, expect us to retain both our league and cup title. There are a few decent domestic sides in Grenada, and the level of competition in the top division has definitely improved since the first year I was here, but I am confident that I can achieve both of these targets. I have successfully put together a pretty hefty backroom staff considering we are a semi-professional club. Assistant manager Anthony Hart has been with me since the start of this save, as has Head of Youth Development Kwan Marshall who has been very successful at recruiting some talented youngsters for the club. Our coaching staff are superb for this level, with Trinidadian coach Ricardo London being the true standout, with a skill set that would not look out of place in some of the lower European leagues. We also recently signed former Mount Rich player Henson Cuffie as a scout. Here is the senior squad that I will be using this coming season. Hopefully there are a few names here that you recognise but there definitely will be a few that you do not! The first thing to point out is that this squad is young! The oldest member of the first eleven in 29 year old Raymond Alleyne but after him, the next senior player is Christ Kisangala at just 24. My strongest starting lineup will feature five teenagers and two 20 year olds. Goalkeepers: I will likely rotate both of these shot stoppers but the best in terms of ability is David Ibeh. The 20 year old Nigerian joined on a free transfer a few seasons ago but spent last year on loan in his homeland. He has only played four Mount Rich games in his career but he looks set to be a primary number one this season. His main competition comes in the form of Marc Walcott, a recent youth academy product who recently made his full international debut for Grenada at the age of 17. Central Defenders: Raymond Alleyne is the most experienced member of the squad having won 50 senior international caps and has been a regular starter for us the past two seasons having joined on a free transfer following a stint in Trinidad & Tobago. You should be aware of Christ Kisangala, the Democratic Republic of Congo defender was our first foreign acquisition and has made 80 first team appearances over the past three seasons. Also in the squad are the experienced Nicko Williams, young Benin national Moukaram Abidjo, who has recently become an established first team player, and Nicko John. 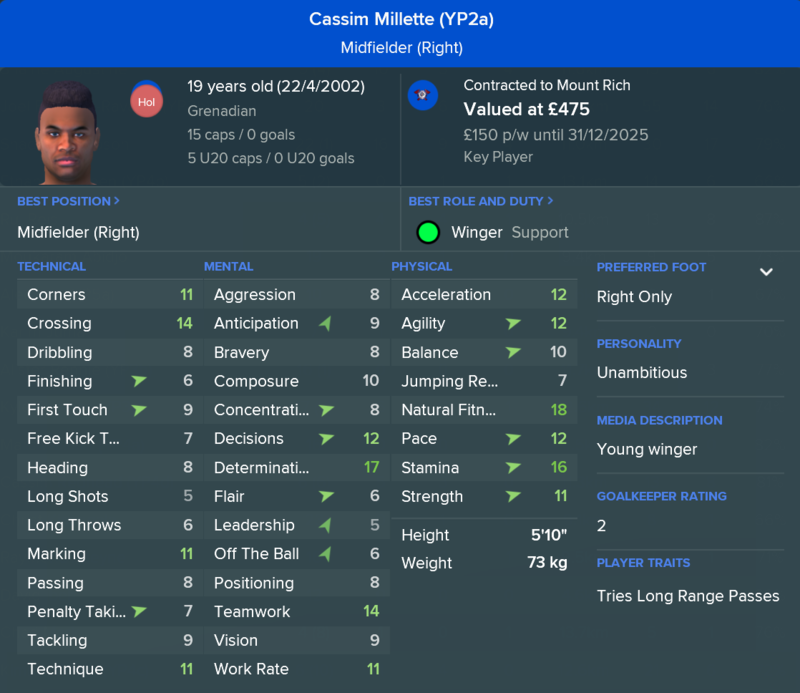 Fullbacks: Despite being listed as a winger, Cassim Millette is easily our best wingback. The teenage youth academy product collected 13 assists in 30 club games last season and is a real talent. On the left we have Joel Alexander, a fellow Grenadian who I picked up last year on a free transfer from Paradise Sports Club. Also on the left I have Tatenda Amini, a young Zimbabwean wingback who is entering his third season with Mount Rich. 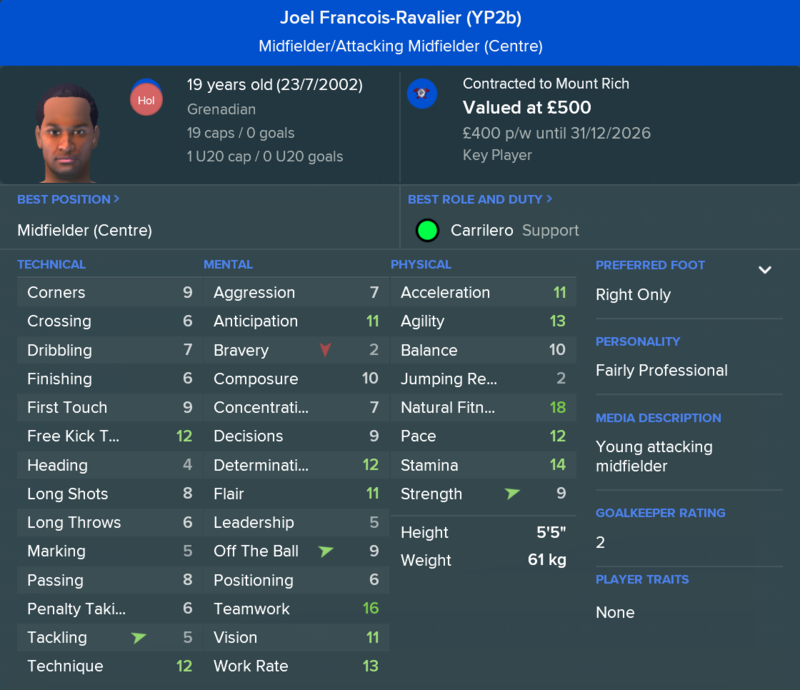 Central Midfielders: We start two youth academy players in the centre of midfield, including one who is probably my favourite player in the squad, Joel Francois-Ravlier. The 19 year old has already made 16 senior national team appearances and is part of the same youth class as Millette - 2018 was a good year for us! Alongside him is the young Alistair Rennie, a ball-winner who made 31 club appearances over his first two seasons with us. The experienced duo of Chad Mark and Kareem Coutain present two solid rotational options. 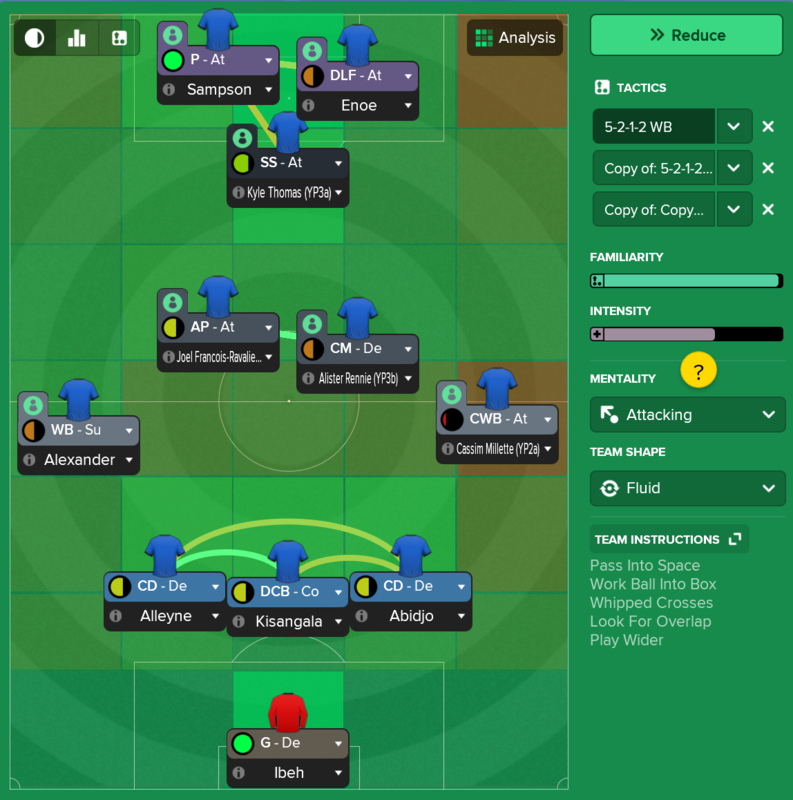 Attacking Midfielders: The tactic I use has the need for a single attacking midfielder or shadow striker and we have a number of solid options in this position. The best, and most exciting, is Kyle Thomas. He is another young youth product but is already one of the better players at the club and is currently gaining preference over Kyle John-Brown who held this role for the past few seasons. Thomas completely bypassed the Grenada U20 set-up and was interred straight into the senior squad, where he has made 8 appearances. Forwards: These are probably the least talented players in the squad but they thrive in our tactic given the talent around them. 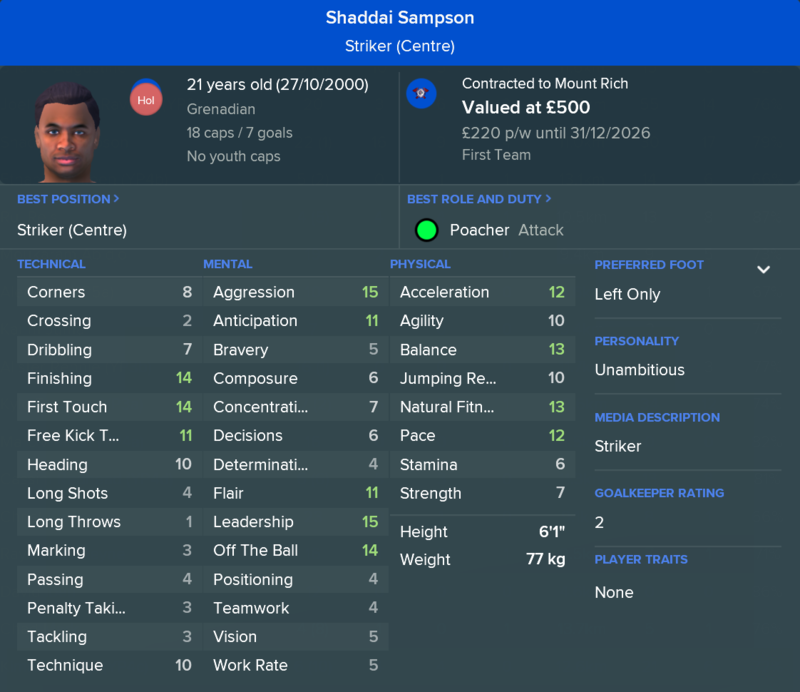 The best is without a doubt Shaddai Sampson, the 20 year old who joined during my first season with Mount Rich. During his time he has become the clubs record goalscorer, netting 59 times in his first three seasons. Alongside him we have Uriah Enoe, another player who joined in my first year and who is slightly behind Sampson with 55 career club goals. Youngster Shavon Bishop never looks that talented but has a definite eye for goal whilst I also recently signed young Shalrie Augustine from Paradise Sports Club and Portuguese attacker Rui Reis to bolster depth. I have managed to build up some very significant depth over the past few years and it has meant we have become the most well-rounded squad in Grenada by a mile. Our U20 squad is very strong and I would not be surprised to see them compete well if they were allowed to play in the same division as the senior side. Some of the better players included goalkeeper Patrick Walcott, who was the clubs starting shot stopper last season and Ugandan central defender Karim Juma, who should get some first team games this year. There is a whole lot of potential in this group and two of the most exciting additions, Kimron Phillip and Cassim Redhead, are from last years youth intake. I have been using this set-up for quite a while now and, due to its success, it is also the one that I utilise with the Kenyan national squad. The three central defenders are primarily responsible for defensive duties, with one being set to 'cover' in order to neutralise any long balls and the pacy forwards that seem to littler Grenadian football. The wingbacks are far more involved in attacking play and provide the width when our build-up play cannot work through the central areas. I will always set one midfielder to play as an attacker and one primarily as a defender to ensure some central balance. I have recently been playing the attacking midfielder as a shadow striker to add some extra offensive firepower and I always have one forward playing slightly deeper than our poacher. I almost always play on 'attacking', including during continental competitions, and I have a number of team instructions that I commonly use. All players in front of the three central defenders have personal player instructions but these are predominately used to minimise/maximise skills such as crossing, dribbling and risky passing depending on player skill level. We had a very successful preseason in terms of friendly results bar an appalling fixture with Grenada Boys Secondary School and a home humiliation courtesy of strong Jamaican outfit Cunupia. Other than those two games, our attacking tactic worked perfectly and we were a constant menace offensively, scoring a total of 23 goals in these eight warm-up games. We headed into the season free of any major injuries and I was therefore confident that we should be able to secure anther league and cup double. I hope this has helped provide some insight into the players I am managing at this level. I am well aware that most of these guys are not particularly amazing in terms of skill level but they are very decent for this level of football. I will hopefully be back very soon with an update regarding the first few months of the league season, following which I will be heading back to Africa for the next round of World Cup qualification games with Kenya. Thanks again for all the likes, comments and views! Really appreciate it you guys! Having detailed the current Mount Rich squad in the last update, I will be starting the next domestic season in Grenada during this one. During my four years in the Caribbean I have put together a superbly strong squad, one which this year has more depth than ever before. The majority of the players I have under contract are very young, meaning we should continue to improve as the years progress. We kicked off the season in style, albeit against a number of weaker sides from the division. We opened our league campaign with an excellent home win against a sold Queen's Park Rangers side before following that up with an emphatic 4-1 away win against newly promoted Boca Juniors and a 5-0 home hammering of New Hampshire United. Our toughest game of the month saw us travel to Paradise Sports Club where, despite falling behind in the early stages, we rallied and secured a brilliant away win. We ended August with another two victories, at home to St. John's Sports and then a closely fought away contest with T.A. Marryshow Community College. Our attacking play throughout this month was amazing. We netted an astonishing 19 goals in just six fixtures as our offensive play was too much for the division to handle. As good as we were going forward, we were also excellent defensively, conceding just twice and keeping four clean sheets. If we keep us this level of play, a second undefeated season could well be on the cards! It is worth bearing in mind that these statistics also include data from our Caribbean Cup games earlier in the year so are not quite as outstanding as you might expect following our league form. Still, we have 16 players who currently hold an average rating of at least 7.0! Unsurprisingly, the star man has been Cassim Millette (7.77). The young right wingback has been in tremendous form and has played a team high 33 key passes leading to 16 chances created. He is pretty solid defensively as well, averaging 3.54 tackles/game through his 10 appearances. Elsewhere in defence, Benin centreback Moukaram Abidjo (7.27) has really stepped up his play, collecting 17 defensive interceptions and chipping in with his first two professional goals. Christ Kisangala (7.04) leads the side with 26 interceptions whilst goalkeepers David Ibeh (7.04) and Marc Walcott (7.03) have spilt shot stopping duties but both have impressed. In midfield, the stand out has once again been Joel Francois-Ravalier (7.57). The youngster has been in fine form again this year and has played 26 key passes to go along with two goals and three assists. Young ball-winner Alister Rennie (7.01) has played solidly alongside him, averaging an impressive 3.38 tackles/game. In attack, some of the new signings have really stepped up. Most impressive has been Shalrie Augustine (8.47), who has netted five times in as many games since joining the club at the start of the season. He has played very nicely alongside the ever present Shaddai Sampson (7.50), who himself leads the team with six individual goals. I have also seen an increase in the level of play of Kyle Thomas (7.15), who has collected three goals and played 19 key passes in his role behind the front two forwards. Unsurprisingly, our excellent league form sees us top the table heading into the international break. Hard Rock FC have started the year very well and they too are currently undefeated (although they have drawn three of their six games). Last seasons runners-up, Happy Hill, have not had the best of starts this year and currently find themselves languishing in 6th position. Our superb attacking performance sees us top the division with a healthy +17 goal difference. We have a slightly tour run of games in September starting with a triple header against a defensively sound Grenada Boys Secondary School, a home game against Happy Hill and then a trip to our only current competition Hard Rock FC. Not too much in the way of other news on the Mount Rich front but I have a few small bits of information that might interest you. Firstly we lost left fullback Joel Alexander to some pulled knee ligaments. The youngster had been playing well defensively and is now the nations number one left back for the senior Grenada side. Luckily we have a very talented replacement for Alexander in the form of Zimbabwean Tatenda Amini. We then lost young forward Shalrie Augustine to a twisted ankle. The 20 year old had been playing excellent, as previously mentioned, and this was a bit of a blow considering how in-form he had been. Still, we had acquired a bit of depth upfront this season and so hopefully it would not be too big a blow to our overall form. That being said, we then lost Rui Reis to a very long-term injury when he broke his toe kicking a ball in training. The Portuguese forward had made just two first team appearances but was next in-line to get some game time after the injury to Augustine. Instead, I will now be relying on the old duo of Uriah Enoe and Shavon Bishop, both of whom have not really got going this league campaign. The latest international break saw the latest Grenada squads be announced and we had a huge number of call-ups! In total, 23 of our players would be representing in either the U20 or senior squads which goes to show how dominant we have become in this nation. So that concludes my first month back in Grenada and it is safe to say that it has been a very successful one. 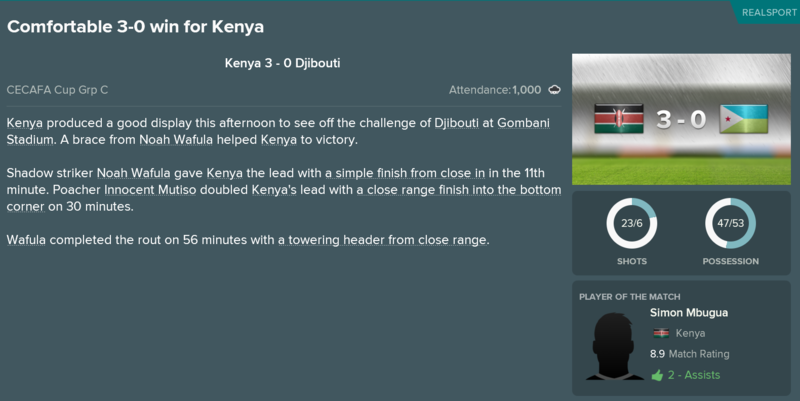 It is now the international break and I have a couple of World Cup qualifiers to look forward to with Kenya so I will likely be switching back to focus on those in my next update. That's a lot of progress in only 5 years. Speaking of turning pro, on previous editions you would need 1.5m+ in the bank if you didn't promote to a higher division where everyone was professional. Sounds like you're a third of a way there. Wanyama is an incredible talent and one who I do not think we will ever be able to replace. That being said, the young centreback Joseph Mwaniki is looking better every time I select a new squad. My staff already rate him as the one of best players in the squad so who knows, maybe he can get somewhere near Wanyama's level... but for now he still plays in the lower leagues of Kenya. Yeah, I had read I would need to acquire a sum around that amount of money... I would have to win a few Caribbean Champions Leagues and get a few appearances in the CONCACAF Champions League in order to get anywhere near the million pound mark. Apologies for taking so long to get this update written, I have not had much time to play the last few weeks but I did manage to get this short international break played. I have really enjoyed managing Kenya thus far. They participate in a number of international competitions and each one has brought a new challenge to this save. The 2022 World Cup is due to be held in Australia and, although Kenya have never previously qualified for a World Cup before, I would have the chance to do so thanks to the CAF Qualifying Section. 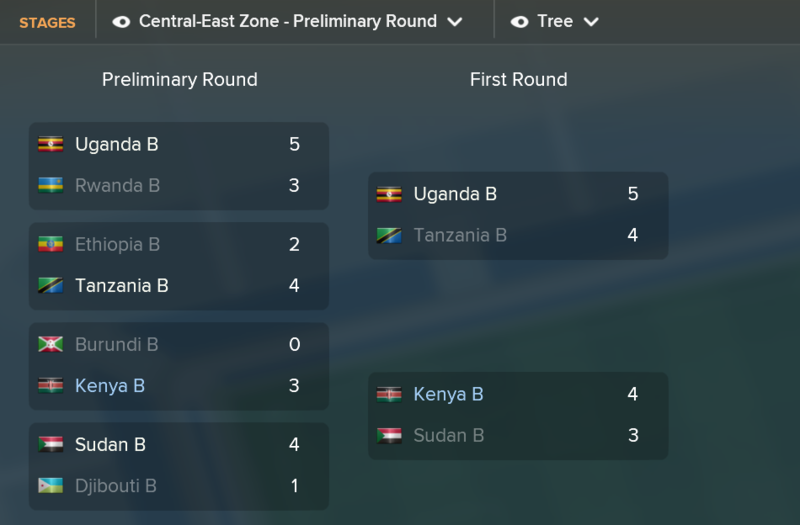 The qualifiers for the African section consist of two initial knockout rounds, both of which had been completed before I joined. Due to our ranking we entered in the second round, where we defeated Mozambique, in a two-legged tie to progress to the group stages. The group stages are very simple, five groups of four teams with everyone playing each other twice and the top placed team from each group qualifying directly for the World Cup. As you may remember, we were drawn in a group alongside Liberia, Benin and Egypt. We had already kicked off our qualifying campaign as we defeated Liberia 4-3 in a thrilling away fixture before defeating Benin at home with a solid 1-0 victory. 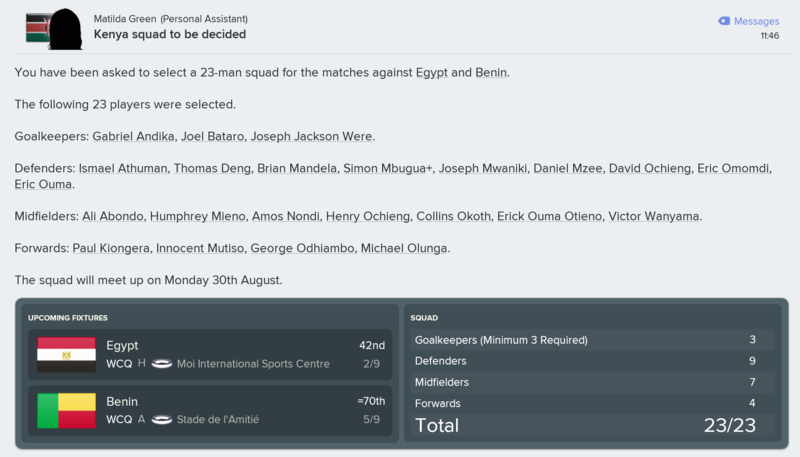 We actually topped the group going into the next round of fixtures since Benin managed to pull off a surprise victory against a talented Egypt side. The next two fixtures for us were likely the toughest of this qualifying campaign so far; a home tie with favourites Egypt and then a tricky away trip to Benin. A few changes here from the usual selections as a couple of injuries meant we were down a few of the regular starters. One injury, to Patrick Matasi, means that young shot stopper Joseph Jackson Were will be handed starting honours in goal. We would also be missing right fullback Jerry Santo, meaning Daniel Mzee or Simon Mbugua (who was carrying a small knock of his own) would have to fill in on the right. Young newgen Joseph Mwaniki is quickly becoming one of the best players in the entire squad whilst I also called up Eric Omondi to the full senior squad after the central defender impressed during the recent domestic-only African Championship of Nations Qualification games. Victor Wanyama is our leader in midfield but English-based youngster Henry Ochieng is becoming more influential at this level. The experienced duo of Ali Abondo and Humphrey Mieno are included as was Collins Okoth, after the experienced holding midfielder also played excellently in the recent African Championship of Nations games. Up front, Michael Olunga leads the line but he will be able supported by the domestic based duo Innocent Mutiso and Paul Kiongera alongside the versatile George Odhiambo. Kenya have never managed to qualify for a World Cup before in their history. Given our exceptional results in our first two games, and the fact that we topped the group, we went into these fixtures with a glimmer of hope at breaking some records. This was by far the most challenging match-up of the group stage thus far, as we faced off against a very strong Egyptian side led by the enigmatic Mohamed Salah and former Arsenal midfielder Mohamed Elneny. Egypt are ranked above us in the world but have not had the greatest of success recently on the international scene, having been knocked out in the last 16 of the Africa Cup of Nations earlier in the year. This was probably the best international performance since I joined Kenya as we ran out deserved winners. This was not a smash-and-grab victory, we actually played very well and created chances freely. We got off to a flying start when Innocent Mutiso slotted home a neat finish from inside the area after just two minutes. Ali Abondo, who had a brilliant game overall, then doubled our lead midway through the first period as he rifled into the bottom corner. The second half saw us switch to a more defensive focus as we attempted to preserve our lead. We finished the game in fine style though as Mutiso grabbed his second of the game, latching onto a brilliant through ball from Abondo, before placing a neat finish beyond the Egyptian goalkeeper. The final few minutes saw us add a fourth after an Egyptian defender turned home a left wing cross from Eric Ouma. We held Mohamed Salah to a 6.7 match rating, where he had just two shots and lost possession more times than he won it back. Mohamed Elneny was even less effective, grading out at a 6.4. In comparison our superstar, Victor Wanyama, had an 8.7 rating and a game his 14 tackles! This was a superb victory for us and one that I really did not expect given the difference in strength of our two squads. 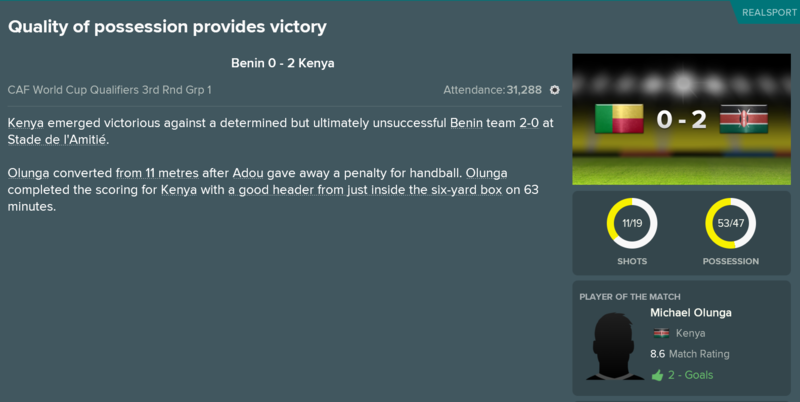 Benin are a pretty solid outfit but we were flying high following our outrageous success over Egypt and we continued our excellent qualifying campaign with another victory. We travelled away to the Benin national stadium and had to play out this fixture in front of a 31,288 strong crowd. 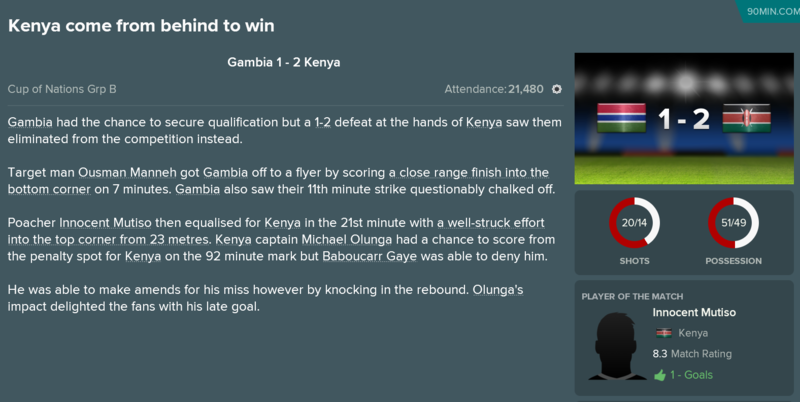 This game saw Michael Olunga take over after a quiet individual game against Egypt. The rangy forward confidently converted a penalty midway through the first half before adding a trademark goal, a thumping header, in the second period following a top cross from left fullback Eric Ouma. We once again did not manage to control possession but we had 19 total shots and limited our opponents to just two shots on target for the entire contest. Victor Wanyama again had a solid game but it was Humphrey Mieno alongside him that stood out. The 32 year old was appearing in his 60th international game and completed 70 passes, four of which were marked as key passes. This victory meant we had now won our first four qualifying games! I never thought such a feat would be possible when I started this campaign! Remember, only the top side qualifies for the 2022 World Cup in Australia. At the moment we are going to be there as we have won our first four qualifying games. Any sort of result (win or draw) in either of our final two games will see us qualify. Even if we lose the next two games, we will still likely qualify due to our extensive goal difference at this time. Egypt and Benin both managed to win their games against Liberia during this international period but our two victories mean we sit above everyone. Our final two games see us travel to Egypt before hosting lowly Liberia in the final round. Two victories against countries ranked above ourselves sees us once again climb the rankings. We are now up to 73rd, just five places behind Kenya's highest ever ranking of 68th, which was achieved back in 2008. When I joined we were ranked 107th but tumbled to 121st after some very poor early performances under my reign. Since then things have been excellent and we are truly clubbing the ranks of international football. That concludes this round of international football, with the final two World Cup qualifiers being played out before the end of the calendar year, I will be back soon to see if we can mathematical secure a passage to the 2022 World Cup in Australia. I am using the same tactic with both Kenya and Mount Rich at the moment and it is providing some excellent results on both fronts! What's the tactic you're using? Those are some tasty results. Doing very well with Kenya. Thanks very much! Hopefully will have some more updates out over the weekend. I know, way better than I ever could have imagined. We definitely have been dealt a nice hand having Egypt in our group as they seem out of sorts at the international level currently. Qualifying for the World Cup would be an absolute miracle! Essentially the same one that I use with Mount Rich (5-2-1-2 with WBs). I have found that three centre backs (with two playing with the cover mentality) usually means I can deal with pacy attackers. In addition, I have Victor Wanyama winning the ball back in midfield and he does a great job at stemming the oppositions best creative players. In attack, the wingbacks provide adequate width whilst my trio of forwards cause all sorts of problems, especially as we play on an overall attacking mentality. I sort of decided it was not worth trying to play defensively or on the counter, as we do not have a goof enough back three or goalkeeper. Thought I might as well take the game to the opposition and thus far it has produced some very positive results. Having had some very successful times with Kenya recently, I am going to switch back my focus to Grenada and our league campaign with Mount Rich. As you may remember we kicked off the season in style, going unbeaten through the first month and seemingly proving too classy for the rest of the Caribbean island teams. This update will cover the middle two months of the year, where we also received our latest youth intake and found out our opponents for the first round of the Waggy-T Super Knockout. We continued our superb start to the year, where we won our opening six games, by recording another seven victories through September and October. We had some potentially tricky games here but we overcame any potential banana skins and ending this two month span scoring 18 goals and conceding just twice. We kicked things off with a closely fought away win against Grenada Boys Secondary School before thrashing a good Happy Hill side at home. We followed that with back to back away wins, including a 1-0 victory against a strong Hard Rock FC team. We beat lowly Boca Juniors and New Hampshire United easily before ending October with a 2-0 home win against title rivals Paradise Sports Club. New signing Shalrie Augustine (7.90) has really been excellent this season in the league, netting 7 times in just nine appearances. The duo of Joel Francois-Ravalier (7.69) and Cassim Millette (7.69) continue to impress, with the youngsters combining for 11 assists, 91 key passes played and 37 chances created. The two youth products have really become the focal points for this side and it is great to see how quickly they have developed. Our defensive play has been solid and young Benin defender Moukaram Abidjo (7.25) has had a fine season. The teenager has chipped in with two goals and 27 defensive interceptions in his 13 games. Christ Kisangala (7.05), one of the few remaining real-world players in my squad, has had another strong season in defence and young keeper Marc Walcott (7.10) has outplayed David Ibeh (7.01) between the sticks. In midfield, young ball winner Alister Rennie (6.99) has played well alongside Francois-Ravalier in his inaugural full season in the first eleven. He has outplayed the likes of Chad Mark (6.94) who has been relegated to a back-up role this year. Our leading scorer this year is once again Shaddai Sampson (7.39). The youngster has netted 10 goals in his 17 games as well as contributing a further six assists. Kyle Thomas (7.11) has also emerged as a classy player. Operating in the shadow striker role, the youth academy product has scored 6 goals and played 23 key passes in his 14 games. With just five league games left to play, the prospect of an undefeated season is very much on the cards. Not only are we looking as though we could go unbeaten, we also look likely to win every single game we play which would result in a maximum points haul of 54 points! 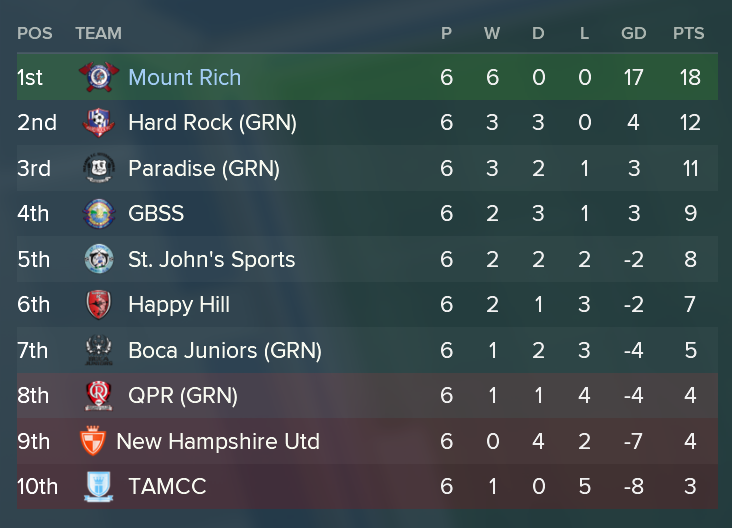 Hard Rock FC have had a brilliant year themselves, losing just the one game to ourselves but elsewhere the league has been a bit of a mixed bag. Paradise Sports Club are third but only a few points ahead of Greanda Secondary School. Happy Hill, after a brilliant year last time out, find themselves in 5th. Things are not looking good for the bottom four sides, with New Hampshire United failing to win a game yet this season! Not too much going on in terms of other news but I do have a few bits to report on from Grenada. No injuries for any of our major contributors but it was a shame to see these two youth academy players go down with fairly severe knocks. Firstly we lost forward Cassim Redhead for a month and a half with a twisted ankle. The youngster had netted his first professional goal this season and looks like a decent prospect for the future if he can avoid any more setbacks. We then lost Ethan McQueen for about eight weeks. The young winger is being converted to fullback and currently backs up Cassim Millette, having made six appearances this year with an average rating of 7.60. It is that time of year again when clubs in Grenada receive their yearly youth intake and this time around we picked up a really exciting prospect. 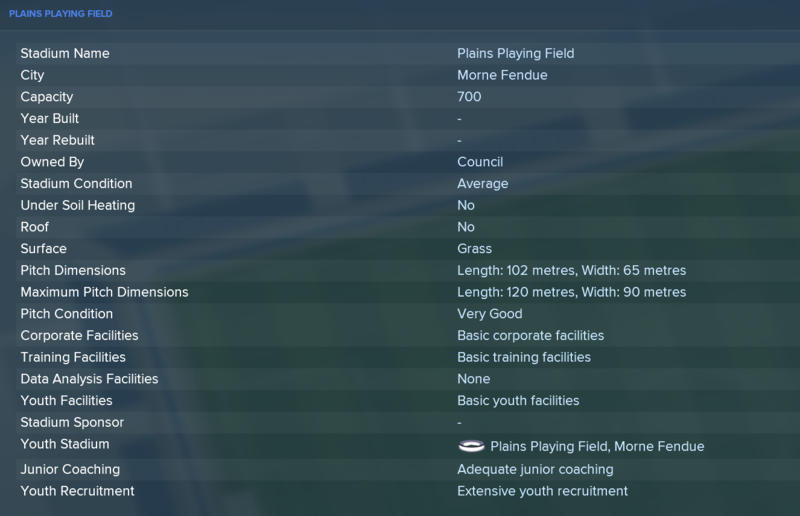 Since joining Mount Rich I have always received players from the youth intake who have lots of potential but given our part-time nature and lack of quality facilities, helping them fulfil that potential has been a bit of a struggle. What I have not seen, until now, is players with high levels of current ability. Alec Leo looks like he could walk into the first team right away and I honestly would not be too disheartened if I received this sort of youth player in the European leagues. Leo is a central defender with a resolute personality and a high level for determination. His physical attributes are pretty solid, with a superb level for strength given his age, although his pace and acceleration need work. He has some solid technical traits, including decent enough numbers for marking and tackling, although he is not brilliant in the air. His mental attributes are very good for a 16 year old, with a good rating for bravery, decisions and positioning. 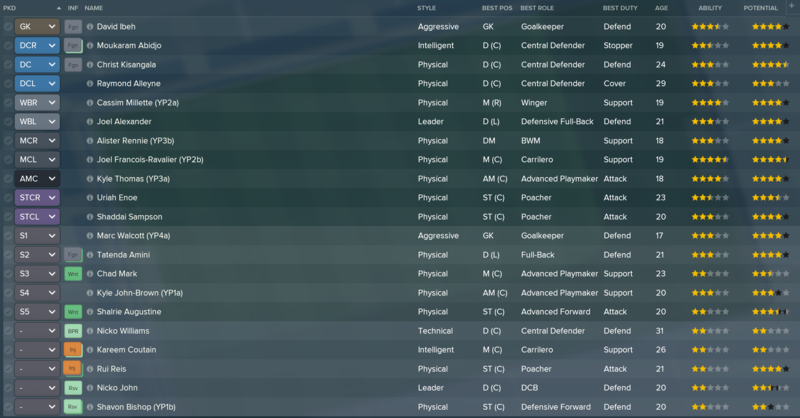 I signed a number of the other prospects in this group, with the best of the rest likely being forward Bradley Mark and holding midfielder Earldon Andrew. Grenada only domestic cup competition takes place during the final month of the season and the draw for the first round has recently been made. We get an away game but against fairly easily opposition in the form of Ball Dogs. This side have been in and out of the GFA Premier Division since I joined Mount Rich and I would be very disappointed if they were able to knock us out. Remember, this is the competition that I have won in every single season that I have have managed in Grenada! Not much to report in terms of my attributes but I decided I needed to keep developing my repertoire. This will see me secure my first continental license and hopefully mean I start to attract interest from clubs. Despite my Grenadian successes and work with Kenya, I have not been offered any other jobs thus far in this save. For now, I am happy in Grenada but it is becoming a bit of an monotonous job given the ease with which we are dominating the domestic competitions. The aim with Mount Rich is to obviously win some form of continental competition but given the strength of some of the Jamaican and Trinidadian sides, that is proving to be a very ambitious aim. I think I will work on making the club the most successful in Grenadian history and when I get to that stage, if I am still struggling with continental progress, I might look for a new club challenge. Hope you guys are all still enjoying this save! I am having a lot of fun playing through it and have become very attached to some of the youngsters that I have developed at Mount Rich. @yatesiboi37 you're back! Very nice update and you do seem to be smashing everyone in your wake. The whole intake looks solid and Alec is a star in the making, can't wait to see him grow! Hopefully for a longer stint this time around! Alec Leo looks like a really solid prospect. If I had him at a professional club with some better training facilities I think he genuinely could become a top player in some of the European divisions. So having updated everyone on life in Grenada we switch focuses again to Kenya and their national team. 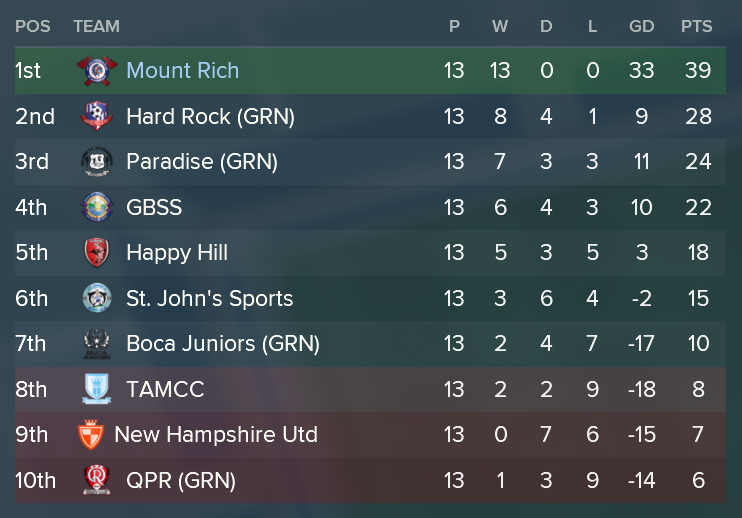 I really hope that all this switching between club and country is not too confusing but it is definitely helping to keep the save interesting given the ease at which I am dominating the Grenadian domestic competitions with Mount Rich. As you may recall, we were in the midst of our World Cup qualifying campaign and were on the verge of achieving something historic. Kenya have never before travelled to a World Cup finals but we were just one point away from booking our place at Australia 2022. Could we do it? With the 2022 World Cup due to be held in Australia next summer, the qualification tournaments for the relevant geographical areas are now coming to a close. The African side of qualifying sees just five sides granted passage to the World Cup, those that finish atop their respective groups. So far we had put together a memorable qualification campaign. We defeated Liberia and Benin in our two opening games before beating favourites Egypt 4-0 in a thrilling game at home. We followed this up with a fourth victory, an away one against Benin to leave ourselves in pole position going into the final two fixtures. Fortunately for us, Egypt lost a match against Benin, leaving us with a six point lead and the knowledge that a single point from our final two games would secure us a place in the World Cup. Even if we lost both games and Egypt or Benin won both of theirs, our rivals would still have to turn around a nine goal differential. No major injury setbacks here and so I was able to select a full strength squad. Newgen, Joseph Jackson Were has become my first choice shot stopper recently and he joins central defender Joseph Mwaniki as one of two newgens in the starting eleven. There is also a call-up for 17 year old Duncan Mbugi, a holding midfielder who looks suited to playing the ball-winning role currently held by Victor Wanyama. Wanyama is the most experienced member of this squad, having now reached 86 international appearances. 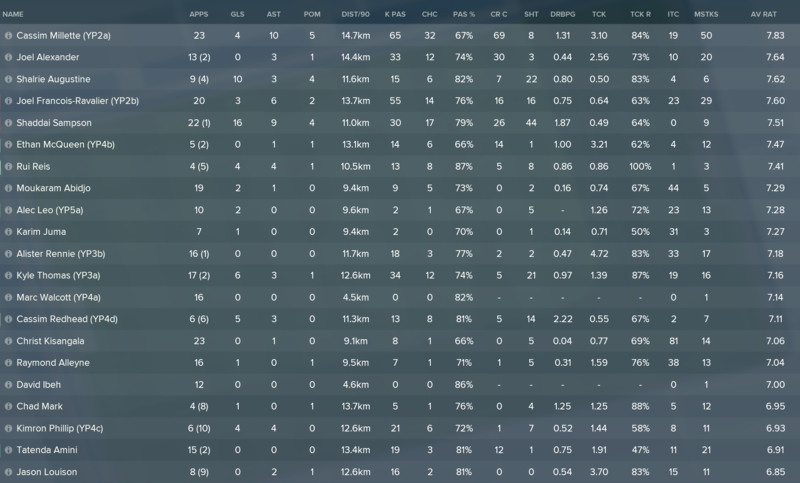 32 year old Humphrey Mieno is another midfield veteran who has racked up 60 caps of his own. Forward Michael Olunga is the countries leading all-time scorer, having netted 40 times in his 59 international games. Ali Abondo has proven to be a very talented addition to the squad. The 32 year old plays for Bloem Celtic in South Africa and was a bit of a late bloomer, totalling 38 caps at this point of his career. We had just two games left in our qualification group, one against a strong Egyptian side before we finished of the campaign with a home engagement against bottom side Liberia. Remember, just a single point required to secure a place at the 2022 World Cup in Australia! Our heroics in the reverse fixture against Egypt were not able to be replicated here as we fell to our first defeat of the campaign in front of a massive 64,507 strong crowd. We had an absolutely awful first half and went into the break trailing by three goals. Our attacking mentality just left us far too open at the back and, although we did create some chances of our own, the clinical finishing of the Egyptians cost us dearly. They took the lead following an early corner and then Mohamed Salah, who we had kept very quiet in the first game, smashed a finish into the bottom corner. Things got even worse when Ramadan Sobhi, now of Everton, finished off the woodwork just before the interval. We kept trying to attack in the second period and we were handed a life line when Paul Kiongera, on as a halftime substitute, swept home a finish just nine minutes into the second half. A nice bit of pressure from us then followed but we could not make it count and Egypt grabbed a fourth when Sobhi stabbed home from close range. 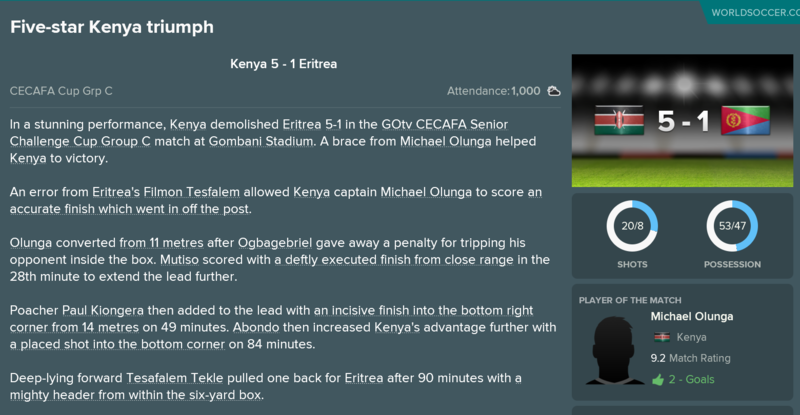 Our leading all-time scorer, Michael Olunga, then scored a fine header late on but ultimately we were outclassed by a talented Egyptian attacking unit. This meant we went into our final game knowing that a point would be enough to see us qualify for the World Cup! Just what we needed! A decisive performance and one that puts this squad in the history books. It was a game for our stars to shine in and boy did they! Victor Wanyama gave us the lead just after the half hour mark when he confidently buried a penalty awarded after a push on Humphrey Mieno. We then doubled our advantage just six minutes later when Michael Olunga tapped home following a brilliant right-wing cross from fullback Jerry Santo. Olunga added his second, and our third, minutes after the restart as he again latched onto a cross from Santo to steer a finish into the bottom corner. There was time for Liberia to grab a very late consolation but overall this was a superb performance and one that highlighted our attacking mentality and willingness to take the game to our opponents. We ended up limiting our opponents to just three shots on target which was very pleasing but once again we struggled to dominate possession. This is not a major concern as the tactic we use is designed to make the most of possession quickly - I am not about that 'keep-ball' life. A stellar qualification campaign sees us finish atop the group and gain a place at Australia 2022. 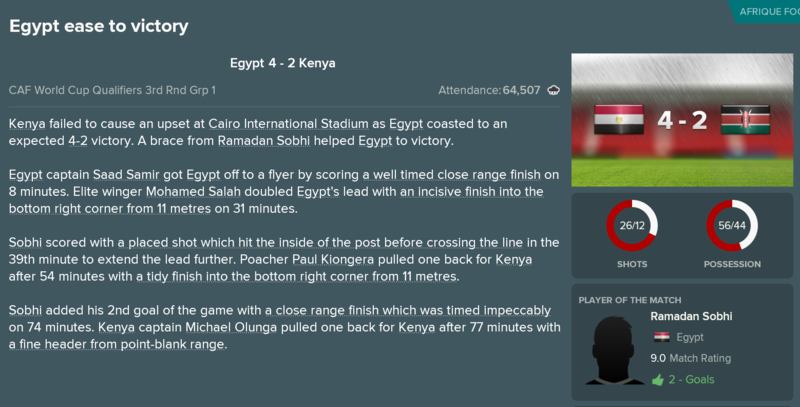 Egypt did win their final two games but our defeat of Liberia in the final game meant we finished with 15 points, from five victories in just six games. We ended the group stages with the both the best attacking and defensive records. We scored an impressive 16 goals, three more than Egypt, and conceded just 8. This will be the very first World Cup that Kenya have ever participated in! Not only that, but I think it will be the first ever World Cup that I have participated in within a FM save, which is very exciting. The African qualification tournament threw up a few other surprises alongside us winning our group. We will be joined in Australia by South Africa, Nigeria, Ivory Coast and Cape Verde. Ghana, Tunisia and Cameroon all finished bottom of their respective groups, whilst Morocco and Algeria both were also nowhere near to qualifying. The main news for the Kenya national team is that of some of the group draws for our upcoming competitions. Prior to the World Cup, the national team will have two other competitions to compete in. The first of those competitions is the CECAFA Senior Challenge Cup. This tournament takes place in December and is one that we actually managed to win last season. It is a small tournament, competed over by the national sides of the Central and East African nations. The initial groups have been drawn and we were awarded a fairly easily looking one on paper where we will play against Eritrea, Djibouti and Somalia. I will look into each of those teams in a bit more detail when the competition kicks off but I would love to be competing in the final of this tournament for a second season in a row. The more committed readers amongst you will remember that we also managed to qualify for the Total African Championship of Nations. This competition takes place in January but has the slight uniqueness in that it is for domestic-based national team players only. We have been drawn in a group with Senegal, Gabon and Zambia. but I cannot read too much into that given the weird squad selection rule. A brief look appears to show that most of the best Senegalese players participate in foreign leagues and therefore will not be available for selection. Zambia have a number of solid looking newgens who still play in their domestic division and therefore they could be a threat. Again, I will look at these teams in more detail when the tournament starts and hopefully this will give me a better understanding of the strength of each side! And the big one... Unsurprisingly we were grouped in with the 4th seeds and so were always going to be given a tough looking draw. Group B, where we will face off against Spain, Belgium and Uruguay! Things do not get much harder than that for your first ever World Cup appearance. Realistically, there is no way I am getting out of this group but it will be fun to get to play in this elite tournament, against some of the best teams in the world. Elsewhere, there are not many groups that are tougher than ours and I think it is probably safe to say that we have managed to find ourselves in the group of death. Nigeria have a tough draw, having to face Brazil, Portugal and South Korea but the easiest group is undoubtedly Group A where two from Australia, Austria, Serbia and Honduras will go through to the next round. The final team in Group H is Costa Rica. So we have quite a lot to look forward to with regards to the national team side of things, culminating in a first ever World Cup appearance. I hope you are all enjoying this side of the save! National team management has definitely added an extra dimension to this career and it is definitely something that I have thoroughly enjoyed alongside domestic dominance in Grenada. 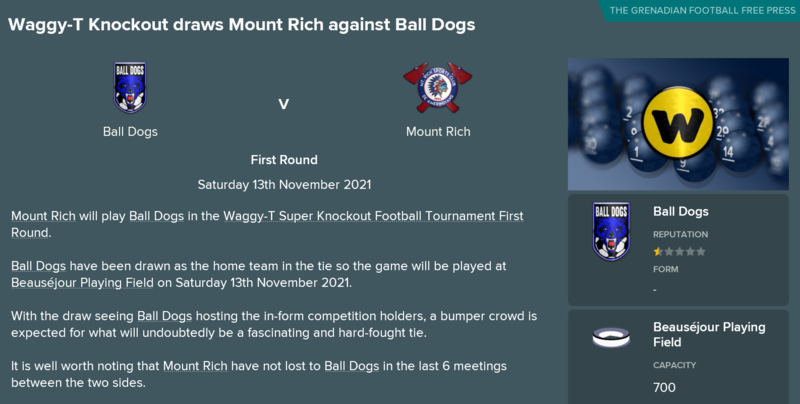 I will be back soon with a final update of the season from Mount Rich, which will cover the final few league games and the Waggy-T Super Knockout Cup tournament! Great job qualifying with Kenya and great to Cape Verde qualify also. I think us and Cape Verde's qualifications are the most surprising. I guess the other underdogs are Iraq and Wales but overall it was a pretty standard qualification campaign. So, we switch our focus back to Grenada where December sees the conclusion of the domestic league. I was riding a personal high having secured a World Cup spot for Kenya and was looking to add to my success with a third consecutive league title for Mount Rich. 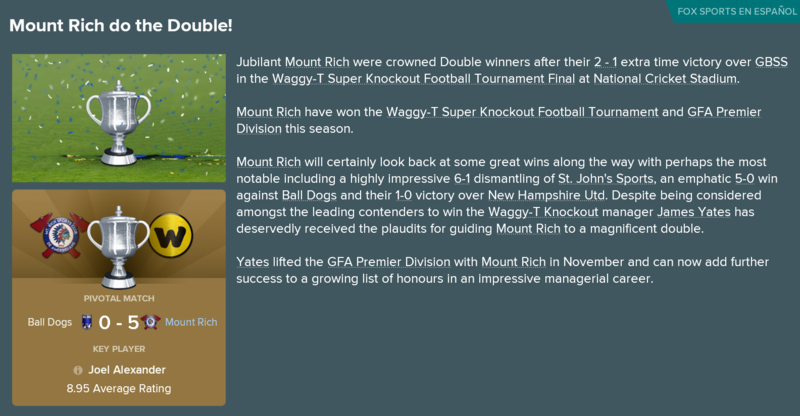 This update will cover the conclusion of the GFA Premier Division whilst also seeing the start of the Waggy-T Super Knockout tournament, Grenada's only domestic cup and one that I have won in all four seasons that I have been at Mount Rich. We concluded the season in fine fashion, managing to complete the entire year unbeaten but narrowly missing out on a full points total as we drew our final two fixtures. The start of November saw us totally dismantle St. John's Sports, in a result that equalled our record ever GFA Premier Division victory. We followed this attacking display with a pair of 1-0 home wins against T.A Marryshow Community College and Grenada Boys Secondary School respectively. We were very close to completing a season of 18 straight wins but we stumbled in the final two games, firstly playing out a scoreless draw with Happy Hill before ending the season with a 1-1 draw against Hard Rock. Amongst our league fixtures we also kick started our Waggy-T Super Knockout campaign. This very simple cup competition is one that I had won in every single season prior to this one and therefore I was expecting big things. As you may remember, we were drawn against Ball Dogs in the first round, a game that we would definitely be favourites for. 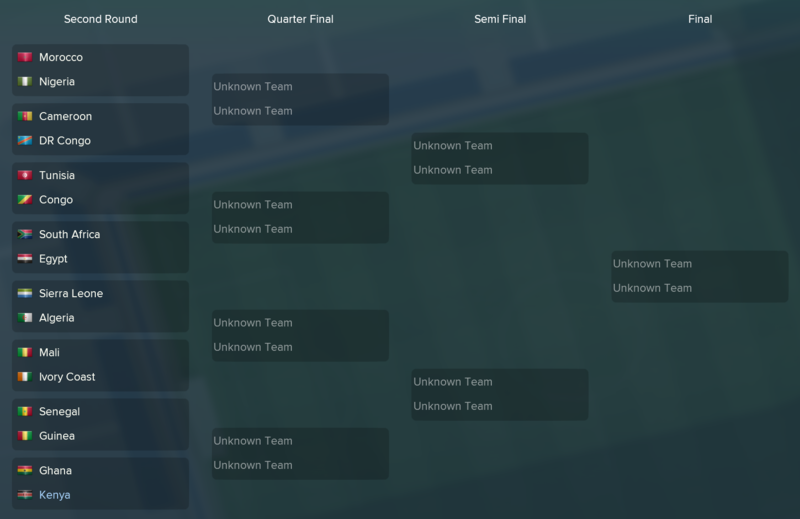 We were given a fairly easy first round draw, where we came up against Ball Dogs from the First Division of Grenada. Despite playing a rotated side we came away with an emphatic victory. We took the lead early on through youth academy forward Cassim Redhead before four second half goals put the tie well beyond doubt. There was a first club hattrick for young Portuguese forward Rui Reis and we cruised through to the quarter finals with a brilliant attacking performance. The quarter final stage saw us drawn against fellow Premier Division side New Hampshire. These guys had been had been having a bit of a torrid league season and given that we were drawn at home I had expected a more convincing scoreline. We took the lead early, when youngster Cassim Redhead rifled in a left footed strike but despite creating a number of chances throughout the remainder of the game we lacked a clinical edge and could never add a second goal. New Hampshire never looked like scoring in fairness and we progressed into the semi-finals, one good result away from reaching a fifth consecutive Waggy-T cup final. The semis saw us drawn against St. John's Sports and we overcame a potentially tough away fixture with a superb attacking performance. You may remember that we beat this same side by an identical scoreline in the corresponding league fixture earlier on in the month. Shalrie Augustine, who has been an excellent addition to the squad this season, struck twice in the opening 13 minutes before Shaddai Sampson crashed a 24th minute header to put us three goals up prior to break. The second half saw us continue our attacking display as Augustine added his third in the 56th minute. There was still time for Cassim Redhead to net his third goal in as many Waggy-T games this season before Cassim Millette completed the rout with a powerfully struck penalty in the closing stages. 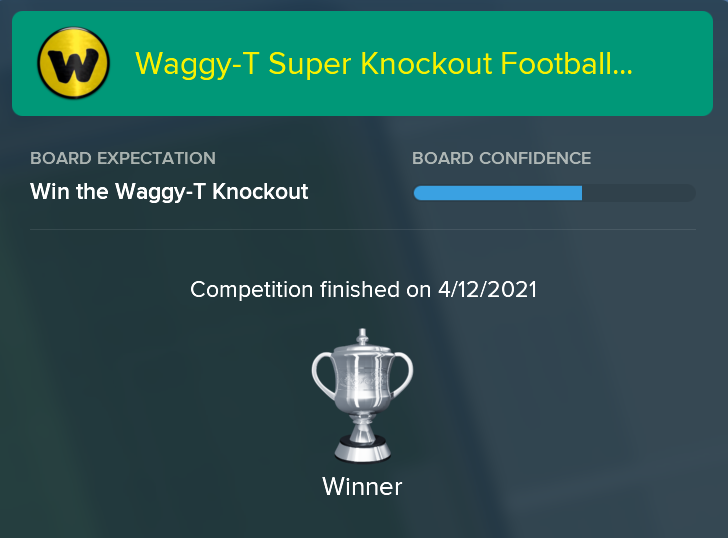 We made this so much more difficult than it should have been but we eventually managed to lay claim to a fifth Waggy-T Super Knockout cup victory. We opened the scoring just before the break when midfield dynamo Joel Francois-Ravalier slotted home from the edge of the area. We absolutely dominated this game and created chances at will but, as has been the case on a few occasions this season, we struggled to find the final product when required. We were punished just after the hour mark when GBSS grabbed a surprise equaliser as they netted from a free kick. We failed to grab a winner in normal time, with Francois-Ravalier missing a penalty kick in the 84th minute, and this meant the game progressed to extra time. We were still the better side in the extra period and grabbed an early goal courtesy of right fullback Cassim Millette, who slotted home from close range. We ended the tie by having a whopping 33 total shots and credit to the GBSS goalkeeper who kept his side in the tie for a lot longer than had seemed possible. Still, we claimed another piece of silverware with this cup victory and, with our fifth trophy, become the most successful side in Waggy-T history. A brilliant league season was built on the back of some excellent individual performances. We ended the year with an impressive 17 players holding an average rating of at least 7.0. The key duo have continued to be midfielder Joel Francois-Ravalier (7.60) and fullback Cassim Millette (7.83). The duo have absolutely dominated the Grenadian league this season and end the year with a combined 16 assists, 120 key passes and 46 chances created. In defence, Benin youngster Moukaram Abidjo (7.29) has been the best of the central defensive trio. He has played very well alongside fellow African Christ Kisangala (7.06), who himself leads the squad with 81 defensive interceptions. Experienced veteran Raymond Alleyne (7.04) also played well and youth academy prospect Alec Leo (7.28) made his professional debut, looking very solid in the process. 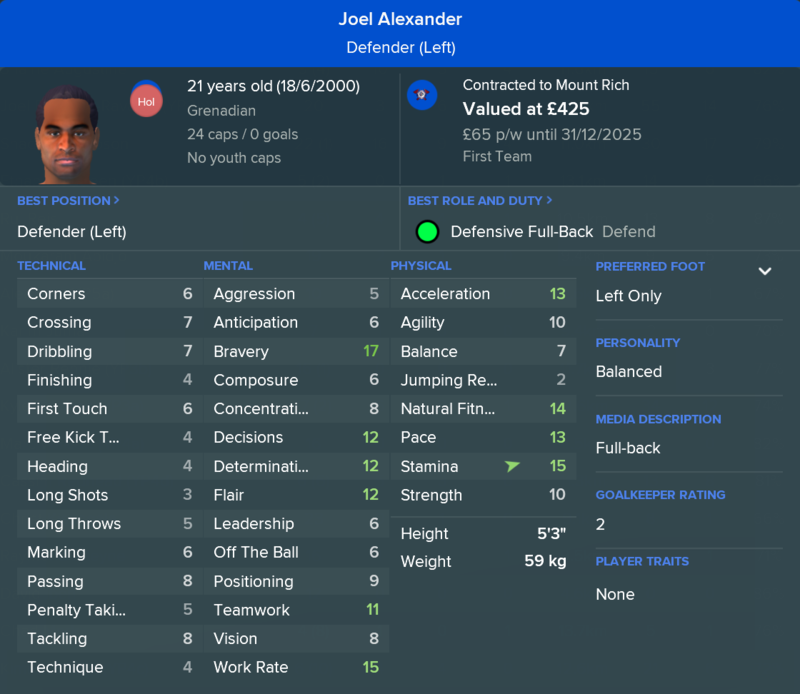 Left fullback Joel Alexander (7.64) had a brilliant second half of the season on the opposite flank to Cassim Millette. In goal Marc Walcott (7.14) slightly outplayed David Ibeh (7.00) but both youngsters were very solid. There was not much to celebrate in terms of our midfield performances than the displays of Francois-Ravalier. Alister Rennie (7.18) had a fairly good year playing in the holding midfield role, averaging 4.72 tackles/game, but the next best central player was Chad Mark (6.95) who was limited almost entirely to substitute appearances. In attack, we had two players reach a double digit goal tally as Shaddai Sampson (7.51) continued his excellent Mount Rich career, scoring 16 times in 23 appearances. His best strike partner was the newly signed Shalrie Augustine (7.62) who had a remarkable debut season, netting 10 times in just 13 appearances. The youngster was limited in terms of games played due to a few niggling injuries but he looks like a very solid addition. Attacking midfielder Kyle Thomas (7.16) had a brilliant year, scoring six goals, whilst youngsters Cassim Redhead (7.11) and Kimron Phillip (6.93) both played well having seen their first serious professional action. 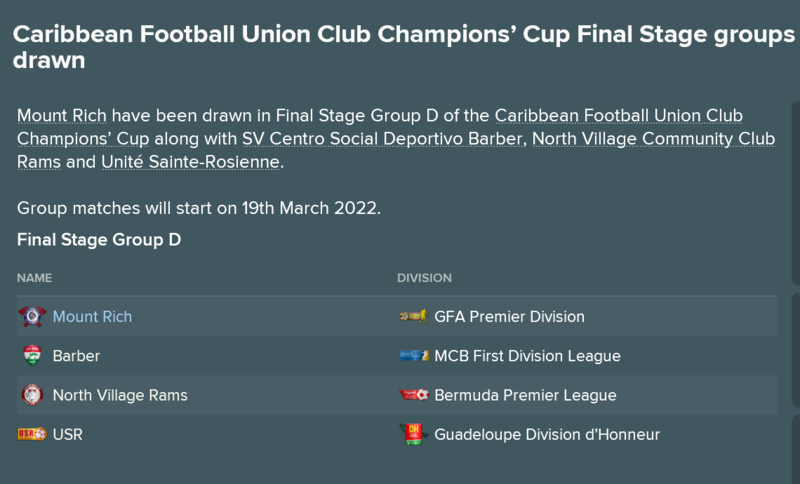 As previously mentioned we failed to complete an all-18 win season but we did go unbeaten and, for the fourth time in five years, we were crowned champions of Grenada! Our nearest challengers were Hard Rock FC and Paradise Sports Club, both of whom had decent league campaigns but never came near to usurping us atop the division. Laggy-T finalists Grenada Boys Secondary School also had a solid year, finishing 4th. T.A Marryshow Community College and Boca Juniors were relegated to the First Division whilst Queens Park Rangers won their relegation playoff and so will remain in the division next year. We scored a very impressive 47 goals this season, nine more than the next best side, whilst also boasting the best defensive record in the league, conceding just seven times in total. This left us with a remarkable goal difference of +40, almost 30 goals better off than the other best sides. A few bits of other news to report on, including a horrific injury and some good news about the clubs overall progression. This is an absolutely huge blow! Joel Francois-Ravalier has become a superb player for Mount Rich and is a regular on the team sheet for his country. This injury was picked up only a few days after the cup final, in a training session, and these damaged cruciate ligaments will see the youngster miss almost the entirety of next season. Given that central midfield has been our worst position in terms of both depth and performances, this is a really big blow to our chances in the upcoming continental competitions. One positive piece of developmental news comes in the knowledge that the Under 20 side won the league for the first time. This shows that the youth players coming through are really developing nicely and this is highlighted by this league win. Shavon Bishop, who dropped out of first team convention, led the way with a league high 4 Player of the Match Awards whilst young keeper Patrick Walcott kept an impressive seven clean sheets. An excellent league season sees us end the domestic campaign unbeaten and double league/cup winners. Things are become a little 'easy' in Grenada nowadays and I guess I really have to consider moving on if I am unable to crack the continental competitions. Our 5th Waggy-T trophy means that Mount Rich are now the countries met successful side in terms of that competition. Our four league titles to date are just one behind Hard Rock FC (5 wins). I think I would like to leave Mount Rich in the knowledge that the Grenadian minnows are not only the most reputable die in the country but also the most successful. 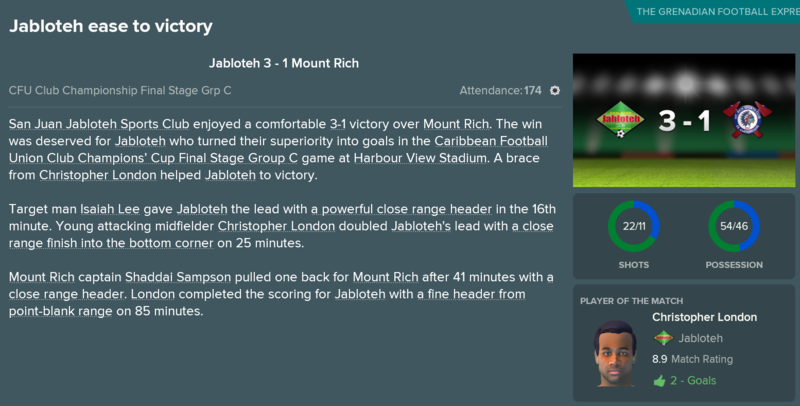 I guess that means I will be staying at Mount Rich for at least two more seasons as I aim for two more GFA Premier Division victories to ensure we stand alone as the best domestic side in Grenadian football history. I will also be taking part in the Caribbean Club Championship in the new domestic year. Before that kicks off I have international commitments to attend to with Kenya, starting with the defence of my CECAFA Senior Challenge Cup title that I won last year. 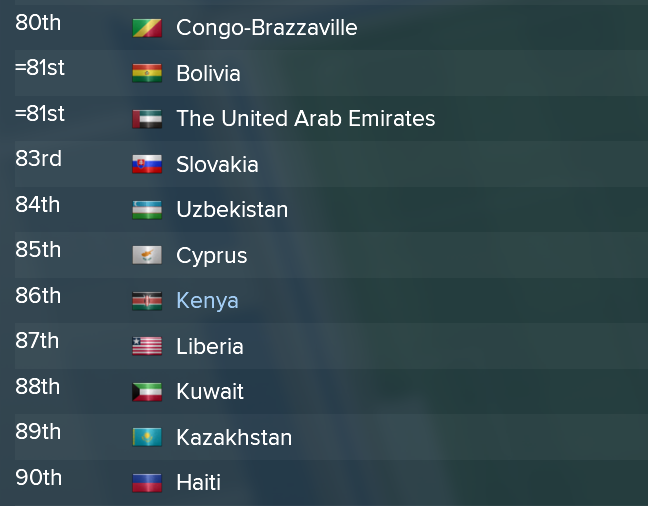 Then, in January 2022, I have the African Nations Championship to attend to - a competition where only domestic-based players are allowed to be used. I hope you are all enjoying this story and would like your opinion on what you would like to see in terms of the domestic side of things. Should I stay in Grenada? Should I move to a different Caribbean nation? 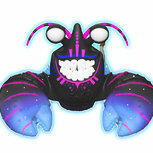 Or would you like to see me move to an entirely new continent and a new challenge? I'd like you to stay and qualify for the CONCACAF Champions League at least once. I would say well done winning the double... but you beat a school team to win the cup. I honestly not sure that I will ever be able to achieve that! I'd have to beat a number of the top Jamaican and Trinidadian sides who, at this stage, are so much better than us in terms of squad talent. I shall try my best though! 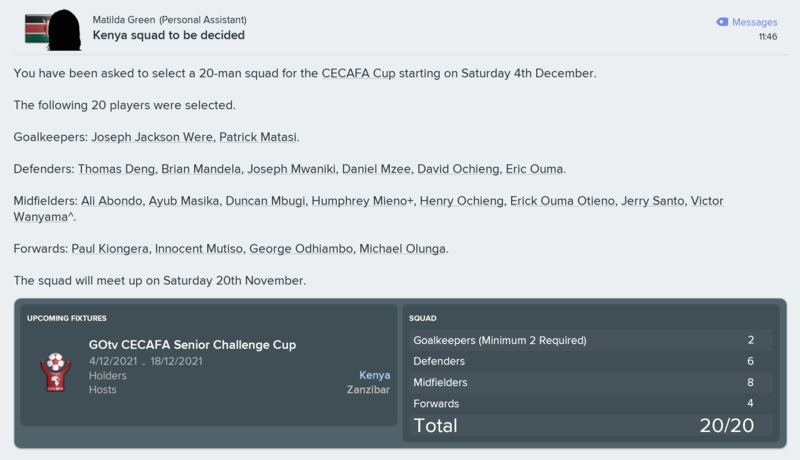 Having recently wrapped up the domestic side of my managerial career in Grenada I switched focus to my final commitment of the calendar year, the annual CECAFA Senior Challenge Cup with Kenya. It has been a long season what with all the international and domestic competitions and this small tournament would be a fun way t wrap things up. The CECAFA Cup is a small, yearly, tournament that sees the best 12 teams from Central and East Africa compete against one another. The competition itself follows a fairly straightforward format in that there is an initial group stage (three groups of four sides). The three group winners and the best second placed side qualify for the one-leg semi finals, followed by a final. 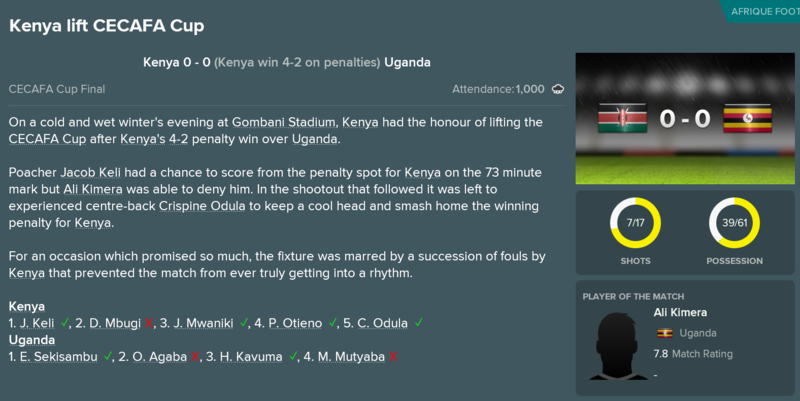 The avid readers amongst you may remember that I actually managed to win this competition with Kenya last year, defeating rivals Uganda in the final on penalties. I would love to end this season with a bit more silverware and this competition presented a very realistic chance of doing so. 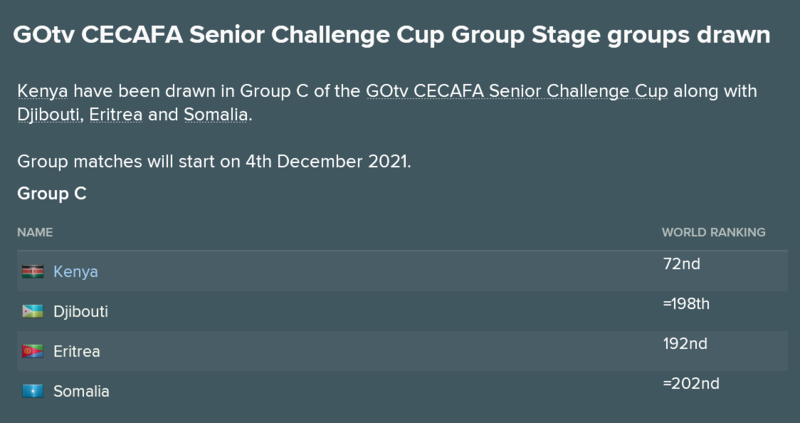 The 2021 edition of this competition would take place on the island nation of Zanzibar, a country whom I did not know had enough stadiums to host a tournament such as this. Still, I was not complaining as Zanzibar has some killer beaches! 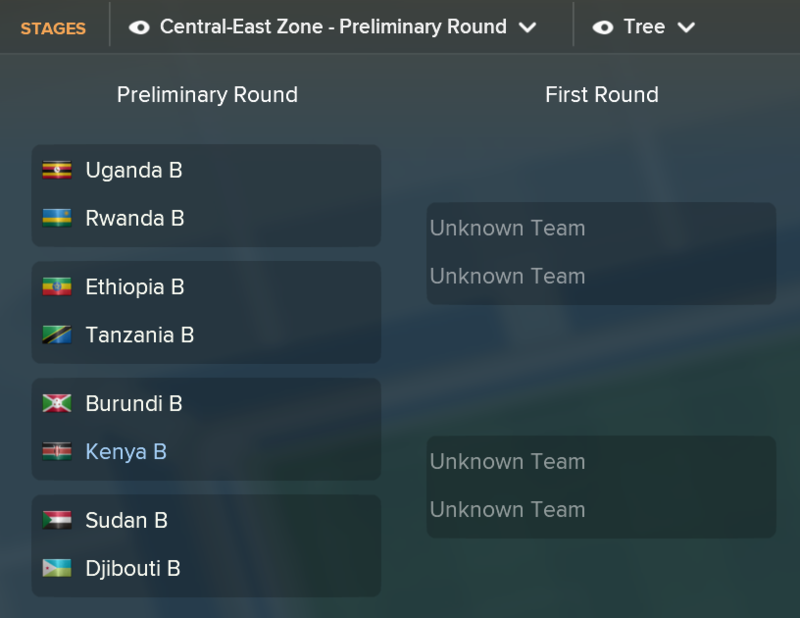 We had been given the easiest group possible, avoiding some of the bigger names such as Sudan, Uganda and Ethiopia, so I would be expecting an easy passage into the semi finals. No huge shocks here as I select a fairly standard squad. There were places for newgens Joseph Jackson Were, Joseph Mwaniki and midfielder Duncan Mbugi. So we would kick off our 2021 CECAFA Cup till defence with three fairly straightforward group games. Of the three sides we would have to play, the biggest threat was probably Eritrea, whom we would have to face-off with first. We opened our campaign with an absolute demolition of a weak Eritrea side. Within the first half an hour we were already leading by three goals. Michael Olunga fired in an accurate finish early on, bouncing in off the woodwork, before adding a second through a powerfully struck penalty. His strike partner, Innocent Mutiso, then added our third when he tapped home from close range in the 28th minute. Substitute forward Paul Kiongera then added a fourth just after the break as he rattled home a strike from the edge of the area. Ali Abondo added a fifth in the closing stages when he placed a shot in the bottom corner following a nice through ball from Mutiso. There was time for Eritrea to grab a late consolation but this did not affect the result following a dominating performance. Another fantastic performance from us as we dismantled a very weak Somalia side, whom we limited to just two total shots for the entire game. Michael Olunga added his third goal in just two games as he rifled home early on from inside the penalty area. The rangy targetman then linked up well with poacher George Odhiambo who slotted home a second in the 20th minute. We were again 3-0 up at halftime as Odhiambo added his second following a brilliant through ball from experienced midfielder Humphrey Mieno. Paul Kiongera again came on as a second half substitute and he scored a late fourth goal as he pounced on a poor back pass. Another excellent performance where we created chances at will, having 22 total shots, and one which meant we were all but guaranteed a place in the semifinals. In a match where the back-ups were utilised and where we actually saw less of the ball then our opponents, we came away with a third straight victory thanks to some excellent attacking play. We again started quickly, scoring twice in the first half hour. Noah Wafula, an attacker who was a late addition to the squad, kicked things off with a simple tap in at the far post before Innocent Mutiso added a second with a sweeping finish following a right wing cross from Simon Mbugua. Mbugua added a second assist in the 56th minute when his cross was headed home by Wafula, ensuring we finished the group stage with a 100% record. Despite being out possessed we still managed to create a number of chances, having 23 shots in comparison to 6 for our opponents. Unsurprisingly, we finished top of our group with a very healthy goal difference of +11. The other three teams to progress to the semifinal stages were Uganda, Ethiopia and Burundi. No room for the much favourited Sudan who were knocked out in the group stages. The semis saw us handed the easiest possible draw as we would be up against Burundi. Burundi are by no means a weak side but I had beaten them in previous years. We were once again outplayed in terms of possession and the number of chances created was very similar between the two of us. In the end, our clinical finishing proved to be the difference as we took full advantage of any sight of goal. Having started our previous three games very quickly we were a bit slower in getting going in this one. When we did eventually break the deadlock though it lead to a flurry of goals. Paul Kiongera kicked things off when he rifled home a 31st minute strike which rattled in off the woodwork. Newgen central defender Joseph Mwaniki then added a second, 11 minutes later, as he smashed home a header following a Humphrey Mieno freekick. Innocent Mutiso added a third almost straight from the restart as Mieno played a brilliant through ball to the poacher who then tucked the ball under the keeper. Three goals in the final 14 minutes of the second period saw us well on top and things got even better when we were awarded a penalty just three minutes into the second half. Up stepped youngster Duncan Mbugi who sent the keeper the wrong way and gave us a 4-0 lead. Burundi grabbed two late goals, either side of a fifth Kenyan goal, but these were mere consolations in what was a dominant performance. The key man here was easily experienced midfielder Humphrey Mieno. The veteran has really stepped up in the absence of Victor Wanyama and has 4 assists in this game alone, to go alongside a brilliant 9.4 rating. This win meant we were through to the final where we would face... Uganda... in a repeat of last years final! Turns out it was almost a complete replica of last years final as the game once again finished 0-0 and had to be decided by penalties. Unfortunately for our opponents, for the second consecutive year, we bested them in the game of spot kicks and were crowned champions of the CECAFA Cup! Most of the games we have played in this tournament we deserved to win but this game could not have been further from that. We struggled to retain the ball on a rainy evening and failed to create many meaningful chances in normal time. We actually did have a chance to win the game though when back-up forward Jacob Keli stepped up to take a 73rd minute penalty but his weak effort was easily saved. The game laboured to penalties and we came through victorious despite a miss from young midfielder Duncan Mbugi. Uganda missed their second and fourth kicks, with young keeper Joseph Jackson Were making a pair of solid saves and, for the second year in a row, Kenya were crowned winners of the CECAFA Cup! So we are once again crowned winners of the CECAFA Senior Challenge Cup. We played excellently in the group stages but definitely got a little lucky in the final, scrapping a victory courtesy of a penalty shootout win over our fierce rivals Uganda. This is the third season that the side have reached the final, having won the competition last year during my first season in charge. 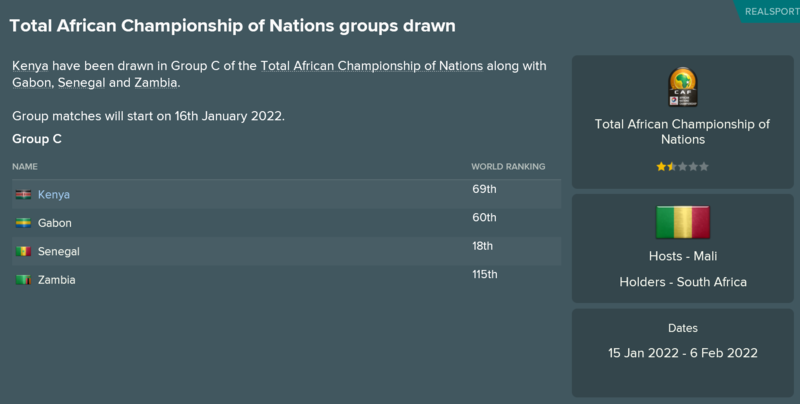 The next international commitment for myself is the African Nations Championship, which takes place in January 2022. 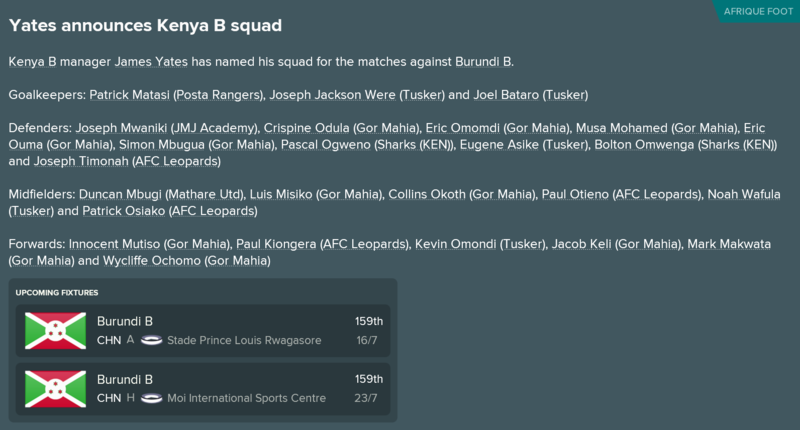 The slightly different tournament is unique in that I am only allowed to use players who are based in Kenya so we will not be seeing the likes of Victor Wanyama or Michael Olunga. Following that we have the big one, the 2022 World Cup in Australia where we will be competing for the first time in our history! So that rounds off everything from the 2021 calendar year and it has been a pretty intense one with World Cup qualification and a trophy win for Kenya alongside another league/cup double for Mount Rich in Grenada. 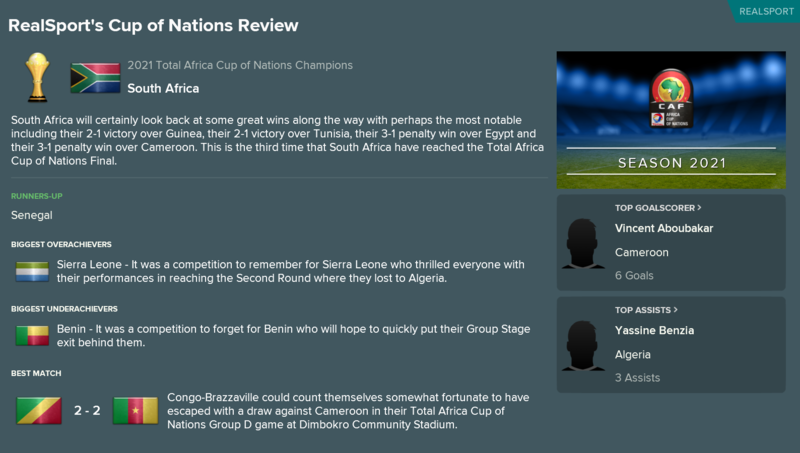 I will be back soon with a season review and then we will be kick starting the African Nations Championship before moving onto the continental competition with Mount Rich as I try once again to qualify for the CONCACAF Champions League. Thanks to all of you readers, followers and commenters out there, hope you are all still enjoying this slightly left-field adventure! Fab job in Grenada, any prospects of a continental cup run? Great stuff with Kenya too, massively overachieving over and over! Amazingly, this is now the end of my 5th season in Grenada and that time has absolutely flown by. Since I joined Mount Rich I have developed the small, semi-professional outfit into the strongest, most dominant Grenadian domestic side. We have absolutely smashed the league and cup competitions whilst also moulding a number of players into senior internationals for the island nation. This season was no different in terms of my sheer dominance and in this short post we shall look back at what happened this year with Mount Rich in Grenada. A second unbeaten season since I joined the club saw us cruise to a fourth league title. The board obviously expected us to win this competition and we duly delivered a resounding season with some excellent performances. In fact, we were just two games away from recording a maximum points total but ended up drawing our final two fixtures to finish on a total of 50 points from a possible 54. We scored a league high 47 goals but that was actually a few less then we have been managing in previous years. Where we have really improved is defensively, where we conceded just seven goals all season in an absolutely dominating performance. Our closest challengers, Hard Rock FC, finished 14 points adrift and it is going to take something special from one of the other clubs to knock us off our top perch. In fact, as previously mentioned, we have now reached four league titles. The most successful team in Grenadian history is Hard Rock FC who have won six GFA Premier Division crowns. The aim, before considering the possibility of leaving Grenada, is to established Mount Rich as not only the strongest current club side but also as the best historical side. In order to do that I will need to spend a few more seasons here and hope to add a few more league titles to the collection. I cannot ask for much more than a fourth league-cup double and a fifth consecutive Waggy-T Knockout win. Grenada's only domestic cup has become a bit of a benchmark for myself as it is a piece of silverware that I have won in every single season of my football management career. In fact, I have now managed 20 Waggy-T Knockout matches, winning all 20 of them. We cruised through the early rounds, recording a resounding 6-1 win over St. John's Sports Club in the semifinals but then required a dramatic extra time win over Grenada Boys Secondary School in order to claim a win in the final. If we ever want to achieve the dream of seeing a Grenadian club appear in the CONCACAF Champions League, we will first have to reach the final of the CFU Club Championship. The best I have managed thus far is a semifinal appearance back in 2019 and I was unable to better that this season. We did manage to power through the initial group stage, going unbeaten against Helenites Sports Club (US Virgin Islands), Sporting Vereniging Juventus (Bonaire) and Racing Club De Riviere-Pilote (Martinique). The final group stage saw us given one of the harder draws as we had to play reigning champions Puerto Rico FC (USA) and Jamaican side Harbour View FC. Despite some spirited performances, we were unable to gain a single point at this stage and were easily beaten by three far superior sides. Getting anywhere close to the talent level of these sorts of clubs is going to be almost impossible and that is going to prove to be a real limiting factor when trying to progress further in this competition. Still, we will be back playing in the CFU Club Championship in the early stages of 2022 and I will be hoping to better the performances of this season just gone. Shaddai Sampson once again finished as the clubs top scorer, netting an 16 times throughout the course of the season. One other player managed to reach a double digit goal tally as new signing Shalrie Augustine scored 10 goals in just 13 appearances. The leading assist provider this season was right fullback Cassim Millette, who tallied 10 in total. Forward Shaddai Sampson finished second, collecting 9 assists, whilst excellent central midfielder Joel Francois-Ravalier added 6 of his own. Fullback Cassim Millette ended the season with the most Player of the Match Awards, picking up 5 whilst forwards Shaddai Sampson and Shalrie Augustine both collected 4 awards. .
Ball winning midfielder Alister Rennie led the team with an impressive average of 4.72 tackles/game in his 17 appearances whilst central defender Christ Kisangala collected a team-high 81 defensive interceptions. It is nice to see some youth academy players already being named in the clubs all-time best XI despite their young ages. Right fullback Cassim Millette and midfielder Joel Francois-Ravalier are joined in the starting side by goalkeeper Patrick Walcott, attacker Kyle John-Brown and forward Shavon Bishop. Moukaram Abidjo had an excellent season and he joins the back three whilst Shaddai Sampson is the clubs all-time leading scorer with 71 goals in just 96 appearances. It is also pretty fun to see some of the previous years' players appearing in this side and reminiscing about their impact on the club. Right fullback Quinton Rennie was a stellar player before being replaced by Millette whilst, the now-retired, Kimron Redhead was one of the best scoring midfielders I have ever managed. It was also pretty fun to see Uriah Enoe and Christ Kisangala both surpass 100 career appearances for the club, a pretty impressive accomplishment given our very short league seasons. This award was really was to decide this year and it had to go to Cassim Millette. The youngster, a product of the youth academy, has really grown into an excellent player and had his best season yet in a Mount Rich shirt. The fullback was a constant threat in attack and terrorised opposition defenders enroute to a team-high 10 assists and an outrageous 32 chances created. He played almost three key passes per appearance but was also solid on the defensive end, averaging over three tackles per game. The youngster was a right winger when he came through the academy but I have been converting him to play as a wingback and it has been a super transition.He has some excellent physical attributes including excellent levels of stamina. His crossing is brilliant but he also has superb teamwork and work rate. The 19 year old is now a regular in the Grenadian national team set-up and has already racked up 15 caps for the senior side. Understandably he is a key player and one who attracted interest from abroad throughout the season. We have managed to hold onto him for now and he is actually under contract for the next four seasons so I am confident he will remain playing here. On the opposite wing to Millette, the newly acquired Joel Alexander had a brilliant season. The Grenadian national has found himself the first choice at left wingback this season and, despite being a more defensive minded player, has adapted to the tacit and put in some excellent performances. He again has some very impressive physical traits including solid numbers for stamina, pace and acceleration. His technical skills are not much to get excited about but he has a very well-rounded mental attribute set, especially given that he is just 21 years old. He has reached 24 senior national team caps thus far and is a regular on the team sheet at left fullback. There is no reason, with little competition at his position, that he cannot be the countries starting fullback for many more seasons to come. The midfield player of the year is also one of my favourites in the squad. Joel Francois-Ravalier joint the team in the same youth intake as Cassim Millette and has developed into an excellent player in the middle of the park. The teenager played an excellent 55 key passes this season whilst providing an excellent attacking link within the tactical strategy. He is another of our youngsters who has a very strong physical make-up, with high numbers for stamina, pace and agility. He has excellent vision, considering his age, and this combined with solid passing and a strong technique makes him a player that I always want to be in possession of the football. The only worry with Francois-Ravalier is the devastating injury that he sustained right at the end of the season. Initial reports looked as though he would miss 11-12 months of football, almost the entirety of next season, which would not only be a blow to our team but also a blow to the development of a youngster who has become a regular on the international stage, collecting 19 senior caps. I am hoping he can rebound and get playing again but it looks like a long road back for one of our superstars. Shaddai Sampson has become one of the best players at the cub and, as previously mentioned, is the clubs current all-time leading scorer despite being just 21 years old. The attacker joined on a free transfer in my second season ate Mount Rich and has been a constant on the team sheet ever since. This past season saw him named top goalscorer once again as he netted 16 times in just 23 appearances. He has the finishing, and first touch of a player much better than anyone found in the Grenadian league system. His off the ball movement and solid overall physical skills are a key factor in him creating separation from sluggish defenders in this league and has helped him become the most prolific forward in domestic football over the past few years. This efficiency has seen him become a regular member of the Grenada squad but, with competition high at his position, he has not quite become a regular starter. Still, he has managed an impressive 7 goals in 18 international games and I am hoping for another excellent season from the youngster in 2022. A new signing at the start of the season, Shalrie Augustine outplayed the more experienced Uriah Enoe and was superb... when he could get on the pitch. The only thing stopping Augustine from winning a more reputable award was the fact that he struggling with a number of niggling injuries which limited the forward to just 13 total appearances this season. Still, in that time he managed to rack up a double digit goal tally, netting 10 times. His finishing is the same as that of Sampson and he also has solid off the ball movement to go along with a well-rounded set of physical skills. It definitely seems like there is a certain mould of forward that is effective in the Grenadian league and it is one I shall be on the lookout for in the future. 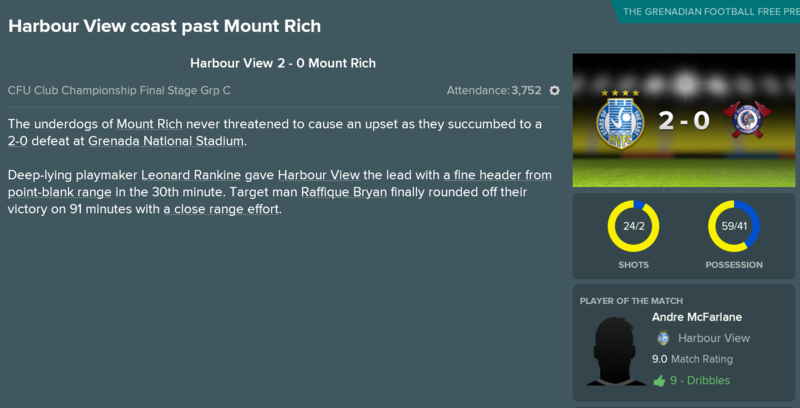 Things have obviously become a bit more routine in the league and cup nowadays, with me entering matches expecting to come away with a victory. The real challenge will be when we kick start our CFU Club Championship camping in just a few months time. It will be interesting to see how we get on this season, especially given the disappointment of the final group stages last season and what with Joel Francois-Ravalier missing through injury. He is one of a few players who can compete with the larger Caribbean sides and, whilst his absence should not affect our domestic performances, he will be a huge loss in the continental competition. Speaking of the CFU Club Championship though, the initial group draws have been completed and we have been handed a relatively easy one on paper. I will go into more detail regarding who I have been drawn against when I return with my next update but you can see who ourselves and Hard Rock FC have been drawn against above - bonus points to anyone who can name which Caribbean islands any of our opponents are based in (ideally without the use of Wikipedia or Google Search). As with previous years, the winner of the CFU Club Championship is granted entry into the CONCACAF Champions League, a feat no domestic side from Grenada as ever achieved. We first need to navigate the initial group stages, which will be achieved by finishing atop our group following three fixtures at neutral venues. I hope you are all still enjoying this save. I know the international side of things with Kenya has become a bit more exciting, especially given our recent World Cup qualification, but I do not want to lose the emphasis on Mount Rich and my attempts to qualify for the CONCACAF Champions League. We have also developed some excellent youngsters here and it is really pleasing to see them performing on the national stage! 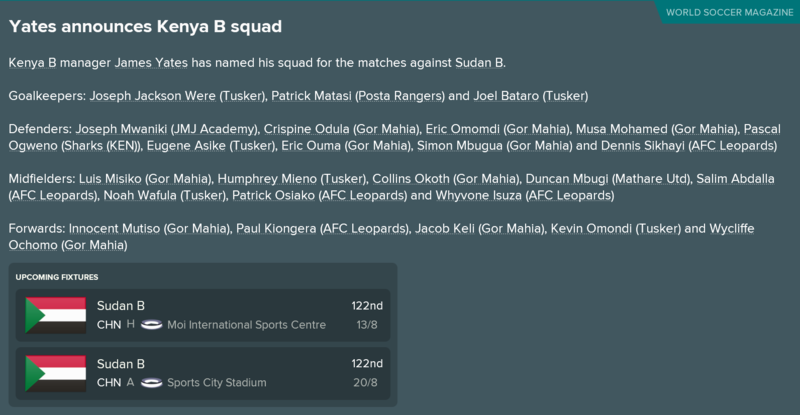 My next update will be with Kenya, as we partake in the African Nations Championship - the tournament where I am only allowed to use players who are currently based in Kenya. After that I will be switching the focus to the CFU Club Championship with Mount Rich where the aim will be to qualify for the final group stage and then hope for a nice draw which will increase our chances of getting into the semi finals once more. 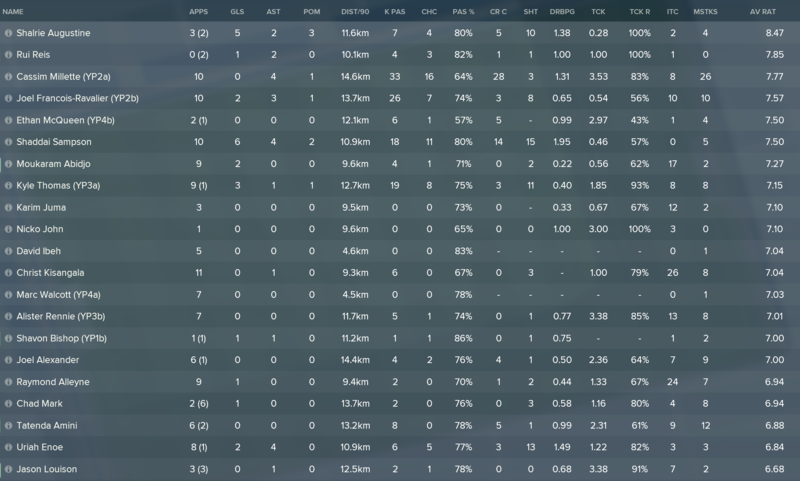 So I have finally managed to work through a rather hectic 2021 season, in which I had some serious domestic and international commitments. 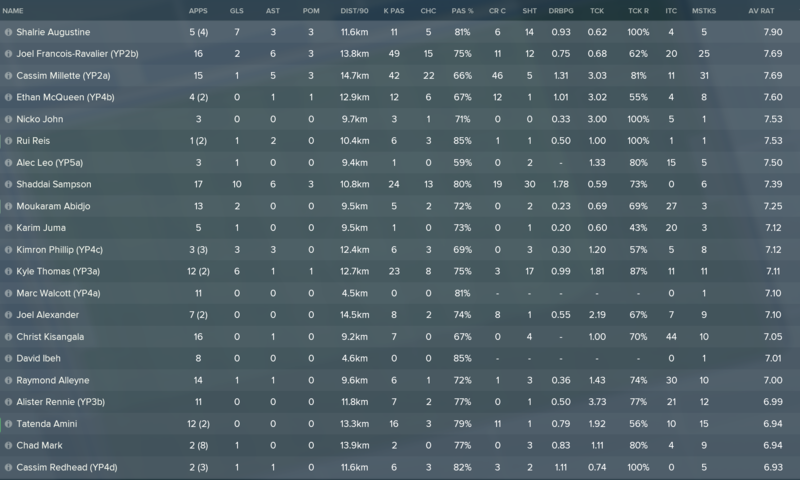 I think it would be fun to take a look at my life in Grenada and use this update as a preview for the new season, my sixth in football management thus far! 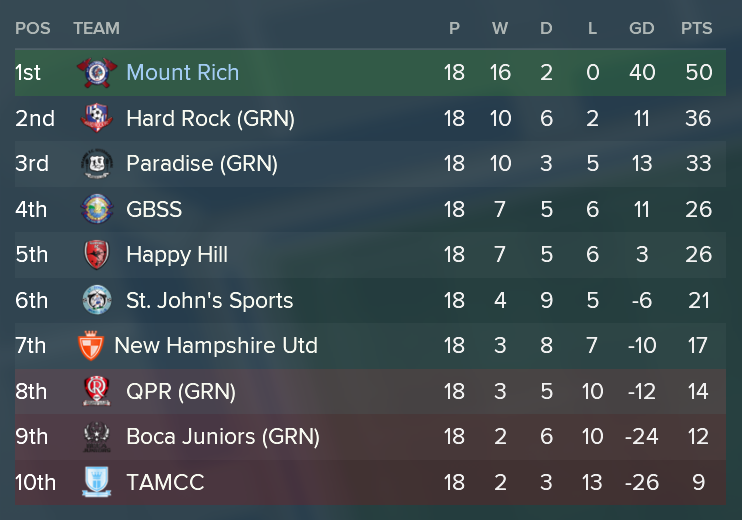 I would like to welcome everyone back to my successful domestic side, Mount Rich of Grenada. Those avid readers amongst you will now have a fairly decent knowledge of Mount Rich, the semi-professional outfit at the forefront of this save. Mount Rich are based in Grenada and were formed in 1986. Prior to my successful reign the small club had never won a serious piece of silverware but since I took over we have acquired 9 domestic trophies (four league titles and five domestic cups). In addition to these domestic successes, we have become a regular participant within the CFU Club Championship and the aim is to, at some point, better the semifinal appearance we achieved back in 2019. We still hold a one star, national level, rating in terms of reputation. Whilst that not seem that spectacular it does make us the most recognisable team in all of Grenada! Not too much has changed with regards to our facilities over the past two seasons. Despite winning quite a lot of silverware, the prize money on offer for semi-professional, Grenadian football has not been quite enough to fund much in the way of improvements to any training facilities. One area that we have continued to improve on however is our youth set-up. Our junior coaching has just received a recent update, and is now up to a god level and our youth recruitment remains at extensive. This, coupled with our fairly decent Head of Youth Development, has seen a number of good prospects come through the youth system in recent years. Our pitch was relaid last season and the condition of it is now very good. Our 700 seater, council owned stadium still stays in an average condition but the lack of financial funds have stalled me from improving the training facilities. The past few seasons have seen me become very familiar with the main domestic competitions of Grenada. The domestic league is called the GFA Premier Division and will be my main focus for this upcoming season. This top level league consists of 10 different sides (with everyone playing each other twice for a total of 18 fixtures), with the top two sides qualifying for the CFU Caribbean Cup. The bottom two teams are automatically relegated to the first division, whilst the side finishing 8th has to contend with a relegation playoff to ensure their survival. As you hopefully know by now, we have pretty much dominated the domestic scene in Grenada ever since I joined. We have won four league titles, in five years, and the focus is now on making Mount Rich the most successful side in Grenadian history. In order to achieve this aim I would need to win six total league titles, which would surpass the current record of five held by Hard Rock FC. The second domestic competition that I will be taking part in is the superbly named Waggy﻿-T Super Knockout Football﻿ Tournament﻿﻿﻿. This little cup competition consists of just three, one-legged, knockout rounds prior to a final played in the national team's stadium. We have managed to dominate the domestic league of Grenada but in the domestic cup competition we have literally been unbeatable. We have won every single Waggy-T encounter since I joined Mount Rich and this has resulted in us claiming five consecutive trophies! Last seasons cup victory actually made us the most successful side in the history of this competition as we have now won the most Waggy-T trophies ever, which is a pretty remarkable achievement given my short reign. We were drawn in Group N alongside Helenites, SV Estrellas and Violette. The weakest side in this group is probably Helenites Sports Club., a side who we actually played against in this stage of the competition last year. They are based in the US Virgin Islands and are the current domestic champions. They are an amateur team, yet they have won the top domestic title in their country on four different occasions and are listed as the nations second most reputable side. Next up are Sport Vereniiging Estrellas from Bonaire. The semi-professional outfit recently won their first, and only, domestic league title having spent much of their history on the periphery. They are currently ranked as only the 6th most reputable side in their country but are led by senior international Eric Smit, an 18 year old newgen who has already made 32 senior appearances! Finally, and probably the most challenging side in our group this season, is Violette Athletic Club. This semi-professional side are based in Haiti but have yet to stamp their dominance in the domestic league despite being founded in 1918. They have won the top division on one previous occasion but qualified for the tournament this year having finished second in their division last season. They have a number of pretty talented newgens, including a very good looking forward in the form of Henri Carrie. Yet again, we will play each side once with just the top placed team progressing, meaning one poor performance could easily see us dumped out of the competition in the first stage. Considering we have made it to the semi finals the past two seasons I would be very disappointed if we failed to get out of this group and, given the strength of opposition, I am thinking we will fare strongly. 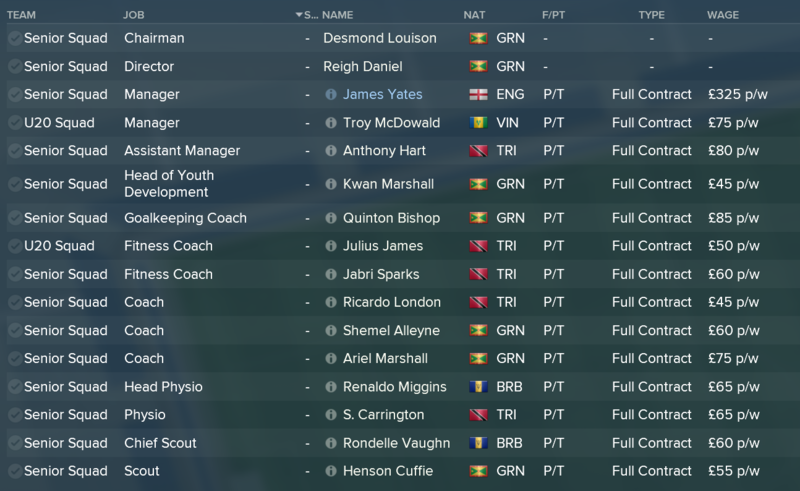 I have kept an eye on the Grenada job ever since I started this save but Andrew Munroe still remains as the main man in charge. During the past five seasons he has not managed to achieve much but has created some stability. When I started this game Grenada were ranked 161st in the world but they have climbed a few places since and are now at 151st. They highest rank they achieved was back in 2019 when they climbed up to 127th. Despite the rather stagnant progress as of late, things are looking bright for the future of the national side. They have a forward in the form of Kimron Sampson, who plays for Manchester City and has scored eight international goals in just nine appearances, who seemingly has the potential to become a seriously good player. Only five players in the current senior side are over the age of 23 so it would appear that as the youngsters develop things should only get better for our small island nation. So that concludes my reintroduction to Mount Rich and to the country of Grenada in general. We will be kicking things off on the island nation very soon as the CFU Club Championship gets started very early in the calendar year. 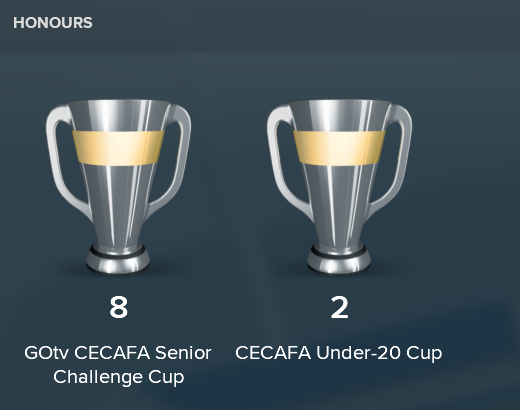 If I am ever going to make it to the CONCACAF Champions League then I will need to reach the final of this competition and so it will be a main focus for me going into 2022. I will be back shortly for a reintroduction to the national team of Kenya, as we prepare for a historic appearance at the 2022 World Cup in Australia. Thanks again for all your comments and views! I know this updates are pretty spaced out but I hope you are enjoying the detail involved. Having written a preview for the domestic side of James Yates' career, I thought it seemed relevant to write one for the international side - especially given that this would be the first footballing action of the calendar year. I would first like to start by welcoming you all back to Kenya. History has not been too kind the Kenyan side but they have managed to pick up a few trophies along the way. They have won the CECAFA Senior Challenge Cup on eight different occasions, including two during my past two years in charge. Other than that they have not managed anything amazing, having never reached an African Nations final nor ever before making an appearance at a World Cup. Speaking of competitions, Kenya's membership to both the CAF (Confederation of African﻿ Football) and the CEC﻿A﻿FA (a su﻿b-c﻿﻿onfederation of CAF that has jurisdiction in Central and East Africa), mean that there is always something going on in terms of international matches. The first, and the one that we will be playing through at the start of 2022, is the African Nations Championship. This tournament is totally separate from the African Cup of Nations and has one very interesting rule. You are only allowed to field players who are current based in the domestic league of your nation. For ourselves, this means the likes of Victor Wanyama and Michael Olunga are not permitted to play and it essentially means the country with the best home-grown domestic league talents have a chance at winning. On paper, this group does not look to challenging but it is so hard to tell given that sides will be playing with domestic-based talent only. Senegal obviously look to be a big threat but many of their best players, similarly to ours, currently play in foreign leagues and are therefore ineligible. It will be a fun competition and will give me a chance to play with a few homegrown newgens who look to be the future senior team stars one day. The second tournament we will be competing in this year is the African Cup of Nations Qualifiers. 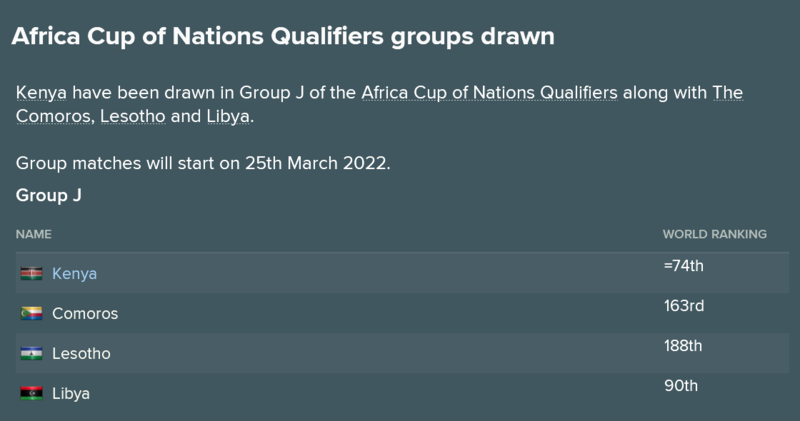 We managed to successfully book a place in the previous finals of this competition back in 2021 where we moved out of the group stage before being knocked out against Ghana in the second round. In order to qualify for the 2023 edition we will need to top our qualification group. We are drawn in a group with Lesotho, Comoros and Libya. Again, it would appear that we have been handed quite a favourable draw but with just one side from this group qualifying we will need to be at our best when we play these three sides in both home and away games over the coming year. The final competition that we have to look forward to this year is the FIFA World Cup. As you may recall we managed to endure an absolutely wonderful qualification campaign and finished atop our group to book a place at Kenya's first ever World Cup finals. Just making an appearance at Australia 2022 will be enough to get my name in the history books but it will also be incredible to go up against some of the best sides in the world. That being said, the group draw was recently completed and, as you might recall, we ended up being handed an absolute monster of a group. Belgium, Spain and Uruguay. We have waited since the dawn of Kenyan football to get here and the footballing gods reward us with a terrifying group. The most realistic notion here is that we get absolutely annihilated in every single game but my personal aim will be to score at least one goal and (maybe) secure a single point. I am looking forward to it and it sure will be a solid way to potentially end my time with Kenya but, come on, it could not have been any harder than this? Domestically, Kenyan football is not anything to get excited about. There are a few professional clubs but the Kenyan Top League is not amazing. A few good newgens have been produced in the country though and it looks as hough the national side will remain competitive in the future when the likes of Wanyama finally decide to hang up their boots. In terms of the national side, their highest ever national ranking before I joined was 68th (back in 2008) but a second consecutive CECAFA Senior Challenge Cup victory and an appearance at a World Cup finals saw us surpass that. Up to 64th and now alongside the likes of Tunisia, Ecuador and Iraq. I am not sure if we will be able to climb much higher than that but it is a vast improvement on the ranking of 107th that we held when I initially took over. I am sure most of these names will still be pretty alien to you all but if you have been following this story at all some of them might ring a bell. One name that most of you are likely to have heard of is Victor Wanyama. The experienced defensive midfielder is one of, if not the very best Kenyan player to have ever lived. He currently plays his club football in China and has recently turned 30 years of age. His 89 caps are the most amongst senior players and he only needs 17 more appearances in order to become the most capped Kenyan of all-time. In terms of goalkeepers, young Joseph Jackson Were, a newgen, has recently taken over from the experienced Patrick Matasi as the countries number one shot stopper. The teenager has already made 17 senior team appearances despite his young years. In defence, another newgen is making a name for himself. Joseph Mwaniki, who is actually currently without a club following the ended of his contract in Kenya, is a superb player who is already a starting caliber central defender. He often appears alongside the veteran David Ochieng who plays in Miami and surpassed 50 senior appearances last season. Fellow central defender Brian Mandela and 25 year old Eric Ouma also both surpassed the half century appearance mark last year. Veteran midfielder Humphrey Mieno moved back to Kenya last year and he has featured heavily alongside Wanyama in the centre of the park. Ali Abondo did not have many international appearances before I joined but the South African based midfielder has become a bit of a favourite of mine and has nine goals in 41 games. Duncan Mbugi is another promising newgen who can play as a defender or a holding midfielder and one who has already racked up 12 senior appearances aged just 17. Forward Michael Olunga, who plays his club football in China, became the all-time leading scorer for Kenya last season and his record of 44 goals in 62 games in pretty impressive. George Odhiambo and Innocent Mutiso have both seen a lot of action during my time in charge and both have managed 17 international goals each. So that squad preview concludes this update where I wanted to reintroduction the international side of management that James Yates is also juggling. The main excitement for this year comes in the form of the 2022 FIFA World Cup but we also have an African Cup of Nations qualification to nativaigate as well as an interesting appearance at the African Nations Championship. Victor Wanyama could easily end the year as the most capped Kenyan of all-time but I am also pretty excited about the emergence of some of our newgens, especially on the defensive side of the ball. I will be back soon with another Kenyan update before switching focus to Grenada and the CFU Club Championship! Hope you are all still enjoying this write up and thanks for all he likes and comments! Good luck with that group. Having reintroduced the two sides that James Yates will be managing this year it is time to actually get kick started with some football. We last saw Kenya in action in the CECAFA Senior Challenge Cup in December, where we were crowned champions for a second consecutive time. Just one month later and we are back in international action with another African tournament. The 2022 version of the African Championship of Nations is held in Mali, with the reigning champions from two years ago being South Africa. The reasoning for this was that the Confederation of African Football wanted to create a tournament that improved the strength of domestic football in African whilst also encouraging individual players to remain in their home nations. As you can imagine, this rule has a huge number of implications with regards to squad selection and opens up the tournament somewhat as countries best foreign players are ineligible. The draw for the initial groups has already been and we will feature in Group C.
It is fairly hard to dissect this draw given that World Rankings and full strength squads are going to play no part in predictions. On paper, this does indeed look like a fairly straightforward draw but given the domestic-only rule I am not entirely sure what sides each of these countries will be able to field. That being said, the weakest side here is probably Zambia. The small African nation are currently ranked 115th in the world and have not had too much success on the international stage in recent years. They did win the African Cup of Nations back in 2012 but have been on a bit of a decline since then. They are one of the sides I have earmarked as an underdog for this tournament though as most of their best players are still based in Zambia. They will be led by newgen forwards Evans Phiri and Enock Phiri (who are unrelated) as well as experienced midfield Henry Banda. A side who look pretty similar to ourselves are that of Gabon. Ranked just above us in the world at 60th they will also be missing some of their best players due to the selection restrictions. A full strength Gabon squad would feature a lot of Premier League talent in the likes of Pierre-Emerick Aubameyang, Pedro Obiang and Didier Ndong but with them all missing I am not really sure what to expect from these guys. Most of their squad for this tournament would never feature in a full strength squad so I think we have a decent chance against them. The final team in our group is Senegal. Again, a number of their big names will be missing but the side ranked 18th in the world will still be able to formulate a fairly strong team. They have a couple of decent newgens, including forward Moustapha Ba and Moustapha Kane who have both established themselves in the countries U20 side alongside a wealth of veteran talent including Yaya Sane formerly of Auxerre and Bursaspor. There are likely to be a few names you recognise here so long as you have been following my story fairly closely but w are severely lacking in quality depth options. We are able to feature a few players whom would be in the starting eleven of a full-strength Kenya side as goalkeeper Joseph Jackson Were, central defender Joseph Mwaniki, fullback Eric Ouma, midfielder Humphrey Mieno and forward Innocent Mutiso still play their club football in the country. In defence, right fullback Simon Mbugua has made 20 previous national team appearances but struggles to make the senior squad nowadays. Musa Mohamed and Eric Omomdi are veteran players who really should not be playing at international level but are the best remaining central defenders. Our midfielders are very weak outside of Mieno. Collins Okoth is a ball-winner who has recently appeared in my full senior squad whilst newgen Duncan Mbugi can play both central defender and central midfielder adding some versatility. Our forwards are pretty good with Paul Kiongera and Jacob Keli joining Mutiso in a solid trio upfront. We kicked off the tournament in very disappointing fashion as we slipped to a poor defeat against a very beatable Gabon side. We fell behind early when a mistake from our best player, Joseph Mwaniki, allowed Gabon to take the lead. We did manage to create a fair few chances in the first period but our finishing was lacking and we struggled to keep possession of the ball. The halftime break gave us a much needed boost however and we were soon back on level terms as Noah Wafula slotted home from inside the penalty area. We could not use the early goal to spark any momentum though and we were pushed onto the back foot. Gabon grabbed the winner midway through the second period when their experienced forward tapped home from close range and consigned us to the worst possible start. No-one, other than Wafula and the experienced Humphrey Mieno played well for us to be honest and we would have to be much improved in our final two group games to stand any chance of qualifying. A slightly improved performance in front of a bumper 21,990 strong crowd against Zambia but we filed to secure three points. Noah Wafula continued his fine individual tournament as he opened the scoring after just seven minutes, rifling in a strike from the edge of the area. Zambia were back in the game shortly afterwards though as they scored an effort which bounced in off the post. We ensured we regained our one goal advantage before halftime though as Jacob Keli swept home a decisive finish just before the interval. Our finishing was much improved in this performance and although we again struggled to keep hold of the ball we were pretty even with our opponents in regards to chances created. Just as it looked like we were about to secure our first victory of the tournament disaster struck. Some poor marking and some neat passing play from Zambia saw their substitute forward smash home a finish past the hapless Joseph Jackson Were. A single point taken in awful circumstances and this meant we went into our final game with Senegal needing a victory to stand any chance of progressing. Oh dear... We tried to play an attacking style knowing that we needed a win but it backfired dramatically and we were totally humbled. Things started terribly as we conceded after just two minutes and then again, literally right from the second half kickoff. I made a few changes and we actually clawed a goal back through youngster Duncan Mbugi who smashed home following a poorly cleared free kick. I sensed we had a chance now to get back into the game but just 10 minutes later and we were again behind by two goals as newgen Moustapha Ba slotted a neat finish past the keeper. We were 4-1 down in the 83rd minute but grabbed a late consolation through a cooly taken Jacob Keli penalty. We definitely did not deserve anything from this game and the result reflected that. We managed just 37% possession and had a disappointing seven efforts at goal. Keli again had a pretty solid game, completing five key passes, but we were outclassed by a very professional looking Senegal outfit. Unsurprisingly, one point from our three group games was not enough to see us progress to the quarter final stage. I was quite surprised to see that Senegal would be joined by Zambia in the next stage, especially given that Gabon had looked the better of the two sides against us. Reigning champions South Africa almost completed a double but were unable to overcome Nigeria in the final with the later winning it in a penalty shootout. Zambia and Senegal both actually went on to reach the semifinals with Zambia triumphing in a playoff game to secure third place at the tournament. Hosts Mali also made it to the quarter finals as did our fierce rivals Uganda. Zambia were awarded the biggest overachiever prize which is fair enough given their world ranking and general international performances. A third place for them was very much deserved after a strong tournament campaign. Tunisia, as well as Morocco, were two of a few surprising sides not to make it out of their groups. The South African players dominated the individual statistics and, on paper, they must have been favourites to win but all credit to Nigeria who secured a first ever African Championship of Nations title. So that concludes a very disappointing tournament for my Kenyan side. It must be said that this is probably the poorest we have performed in a major competition since I took over the side. Although most of this squad will not feature in the upcoming African Nations Qualifiers or the World Cup, I am hoping that this disappointment does not have too big a dent on moral going forwards. It was always going to be a challenge putting together a strong, domestic-based, Kenyan side and it turns out simply qualifying for this tournament was an achievement in itself as our national league players were definitely outmatched throughout. 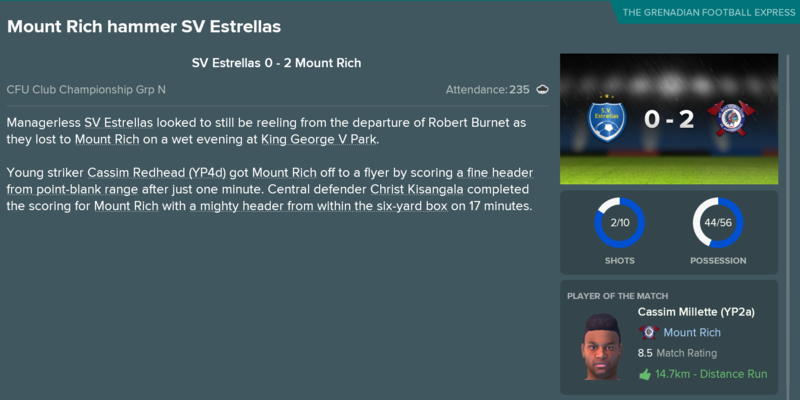 I will be switching focus back to Mount Rich in the next update as we prepare for the start of the Caribbean Football Union Club Championship, the ever exciting continental tournament that offers us an unlikely passage into the CONCACAF Champions League! 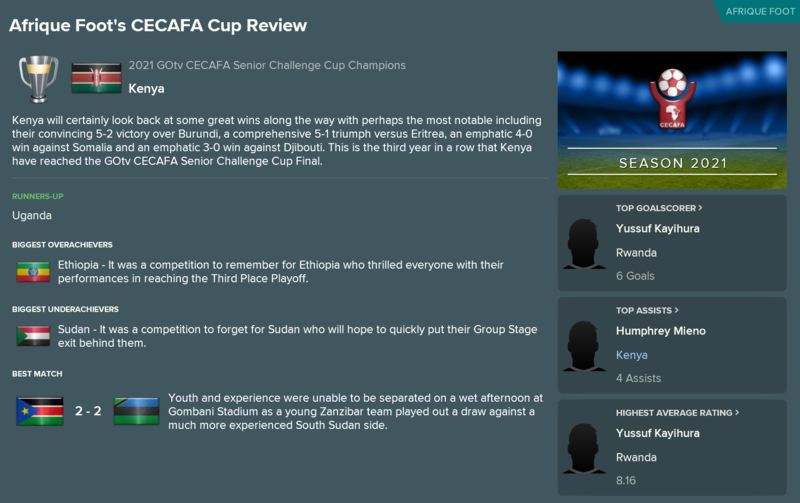 Having endured a disappointing start to the year with Kenya in the African Championship of Nations, I was hoping for some improved fortune as we headed into the CFU Club Championship with Mount Rich. The domestic season finished way back in December and this is the first time that I have seen the Mount Rich squad since but I am hoping they are all prepared for some continental football. Having stupidly forgotten to do so last year, I remembered this time to schedule some friendly games in preparation for the CFU Club Championship. We played some decent sides in here including St. Ann's Rangers and Club Sando from the Trinidad & Tobago top division. I was very happy with how we played, especially defensively where we kept three clean sheets. We also managed to come away from these four fixtures without any major injuries which is always pleasing. As you may recall from my previous update we had been handed a fairly good looking draw, as we were grouped alongside Helenites Sports Club (US Virgin Islands), Sporting Vereniging Estrellas (Bonaire) and Violette Athletic Club (Haiti). 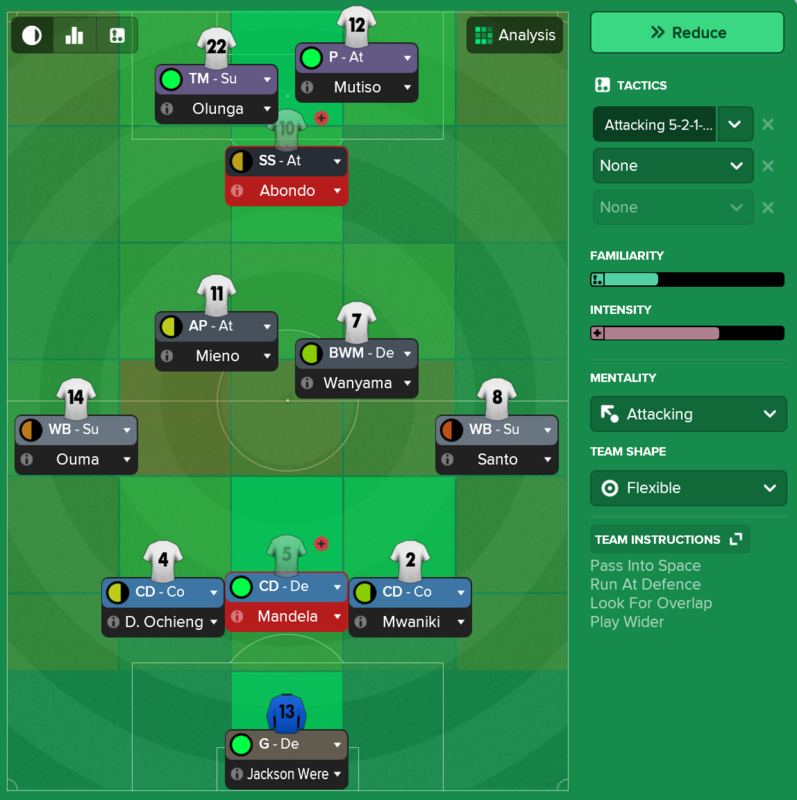 We travelled to Martinique for our opening fixture against Violette who, on paper, were probably the toughest opposition we would face in this opening round. The pre-tournament friendlies appeared to have done the job though as started the group games off with a victory, although it was one that we had to wait to complete. The first half was a fairly poor affair with neither side able to create any real chances and both sides sharing possession. The second half continued much in the same vain but a penalty awarded to us on the hour mark sparked a wild final thirty minutes. Young wingback Cassim Millette stepped up to take the kick but saw his decent effort acrobatically parried away by the Violette goalkeeper. Just eight minutes later and the game swung massively in our favour. Another penalty was awarded, along with a second yellow card, after Uriah Enoe was tripped in the box. Millette, not fazed by his previous miss, stepped up again and buried this kick into the top right-hand corner. With Violette struggling and down to ten men we made the killer blow when Kyle Thomas scored with a neat shot from inside the area just five minutes later. There was still time late on for Shaddai Sampson to curl home a brilliant freekick and give the scoreline a more emphatic look. Overall though this was a solid performance and one in which we very much deserved the three points. Our second group game saw us absolutely dominate the minnows from the US Virgin Islands. 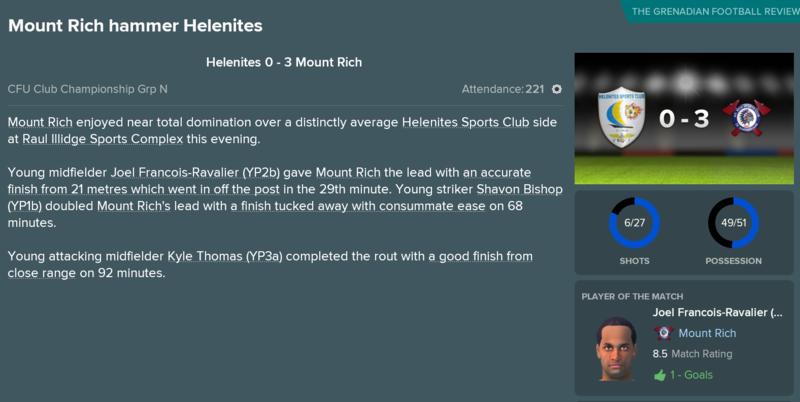 We travelled to Guadeloupe to play Helenites and we came away with another 3-0 victory courtesy of some excellent attacking play. Shaddai Sampson opened the scoring in the first half as he collected a brilliant through ball from Alistair Rennie before firing in a powerful shot. We then doubled our lead just before the interval when we were awarded another penalty. With Millette being rested, young Ugandan central defender Karim Juma stepped up and delicately slotted home. The second half saw more of the same from us as we created chances freely. Rui Reis managed to grab a late third as he smashed home a thumping header following a neat cross from attacking midfielder Kimron Phillip. Two victories from two games meant we entered the final round knowing that any form of positive result would guarantee us a place in the next stage. A third clean sheet and another dominant performance saw us easily see off Bonairean side SV Estrellas in Canada. We scored a pair of early goals which were enough to give us a comfortable cushion and we cruised throughout the remainder of the game with our opposition never looking likely to score. We scored almost straight from the opening kickoff, with young forward Cassim Redhead slamming home a header after just 16 seconds of the match; a goal which would turn out to be the fastest ever in both Mount Rich and CFU Club Championship history. We added a second in the 17th minute when enigmatic fullback Cassim Millette crossed for Christ Kisangala to head in from a corner kick. Another fine victory and one where we did not have to exert ourselves too much yet still were able to rest some key players. Unsurprisingly, with three victories and three clean sheets, we topped our group with ease. Violette managed to end the group stage in second place whilst Helenites endured a horrible campaign, ending with a goal difference of -10. This stage of the competition last year saw us draw a hideous group that included reigning champions Puerto Rico FC and a see from both Jamaica and Trinidad, meaning we were subsequently knocked out. This year though, the footballing gods have been much kinder to us (which I think is fair given our awful World Cup draw with Kenya) and this is a group that we could conceivably get out of! We have only managed to progress from this stage once, back in 2019, and so I do not want to get too excited but could this be the year? There is not much to choose between these three sides but if I was going to be selecting a 'weakest' I would probably opt for the brilliantly named SV Centro Social Deportivo Barber. The semi-professional outfit from Curacao are probably the least established in their respective domestic league having only won the title on two separate occasions. They have a couple of good players but no-one too daunting with their best being Charlison Smeekes, a newgen central defender who is a full senior international and currently attracting interest from Portugal and USA. Secondly we will have to play North Village Community Club Rams. Another semi-professional club, the Rams have an impressive history in Bermuda where they have won the league title 10 times and the domestic cup on 8 occasions. Their current squad is far from amazing though and the newgens coming through are not all that talented. One to watch out for though is right winger Gary Villamarin who already has 8 assist and 4 goals in just twelve league games this season. Despite their domestic performances, this will be the first time the Rams are performing in the CFU Club Championship final stages. We were not the only Grenadian representative in the Club Championship, as last seasons league runner-up Hard Rock FC were also involved. They endured a pretty miserable campaign, failing to score a single goal and finishing third with just two points. It is seemingly going to be a little while until we have any other Grenadian side joining us in the final group stages as every year so far the other side involved has been emphatically knocked out in the first round. So that concludes the initial group stages of the CFU Club Championship. We again manage to progress but now face the tough task of getting out of the final stage and into the semifinals - a task I have not been able to achieve for a while. Doing so would give us the chance of qualifying for another continental competition though which is always exciting and, given the draw we have been handed, it would appear that anything could be possible. Thanks again for all the views and comments. I have a bit of free time today so am trying to get a few updates written up! Hope everyone is still enjoying this adventure! 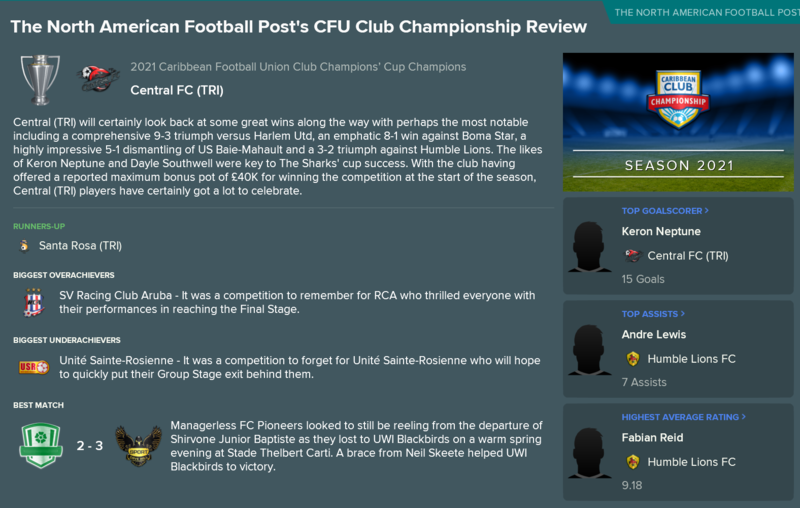 The previous update saw us ease through to the final group stages of the CFU Club Championship, where we were handed a much easier looking draw then the one we received last year where we were knocked out of the competition at this stage. The winners of the four groups at this point of the competition qualify for the semifinals, where the lure of further continental qualification in the form of the North American League or the CONCACAF Champions League awaits. For now though, we were focused on qualifying for the semifinals, a feat that I have only before accomplished once in this career! There was no time for friendly games in between the two group stages so we are heading straight into the meaningful games here! As you may recall from the previous update (where you can find previews for all our group opponents) we were drawn against SV Centro Social Dep﻿ortivo Bar﻿ber (Curacao), ﻿North Village Co﻿mmunity Club Rams﻿ (Bermuda) and Unite Sainte-Rosienne (Guadeloupe). This stage of the tournament follows the exact same structure as the last, with three games at neutral venues with the top placed side qualifying for the next stage. We travelled to the US Virgin Islands for the opening game of this round where we faced off against current Curacao champions Barber and got our final stage campaign off to the best possible start with a dominating victory. We continued our tradition of being awarded penalties in this competition when we were handed a spot kick after just two minutes. Forward Uriah Enoe stepped up but his tame effort was easily parried away by the Barber goalkeeper. One day these missed spot kicks are going to come back to haunt us but today was not that day as, on the half hour mark, Kyle Thomas slid home a nice finish following some good passing play on the edge of the box. Thomas, who has really grown into a fine player recently, added his second just after the interval when we drove home an angled finished. Enoe's afternoon went from bad to worse when he was forced off through injury but his fellow forward, Shaddai Sampson, grabbed a third as he rifled home a typically instinctive finish with just 15 minutes to play. An excellent opening performance saw us dominate possession and limit the opposition to just two shots on target. We created chances freely and played the style of fluid attacking football that I have been constantly championing at Mount Rich since I joined. Our second group game saw us travel over to Puerto Rico where we faced off against Guadeloupe side USR. The semi-professional club have beeb dominating their domestic league in recent years but we put together anther fine performance to gift us a second win. We took the lead early on when young attacker Kimron Phillip slotted home from close range. The youngster has been given a more predominate role following the long-term injury to Joel Francois-Ravalier and thus far he is thriving in it. His inexperience was highlighted shortly after though as a poor pass led to USR grabbing an equaliser just before half-time. We had again been the better side and seen more of the ball so I was confident we would be able to find some more goals. Surprise, surprise we did manage to add a second, courtesy of yet ANOTHER penalty! This time Karim Juma, the Ugandan central defender, stepped up and confidently buried it into the bottom corner. Phillip managed to make amends for his earlier individual error as he crashed home a close range header late on to give his a second goal for the day. The only sour note was that of Anthony Stoute receive a late red card for a second booking. The youngster was making his professional debut for us and had played very well up until that point. Still, another excellent victory where we always looked in control and one that put us in the driving seat heading into the final round of games. A third win of the group stage saw us net another three goals as we demolished North Village Rams in The Cayman Islands. An explosive first half saw us blow away our opposition and leave the result in no doubt. We opened the scoring early when young forward Cassim Redhead headed home a cross from fullback Ethan McQueen. It did not take us long to add a second with another headed finish. This time Moukaram Abidjo rose highest to power home a finish following an excellently taken freekick from Kyle John-Brown. Redhead had the ball in the back of the net again moments later but his close range effort was questionably ruled out for offside. We continued the onslaught in the second period and Redhead finally grabbed his deserved second goal when he rounded the Rams' goalkeeper and tucked home a close range finish. For the third consecutive game we bettered our opponents in terms of possession and created a huge number of chances in comparison to them. Another three wins from three meant we topped the group and would be progressing to the semi finals for only the second time in our history. USR, who I had highlighted as the 'strongest' team in this group had a torrid time and finished dead last whilst Barber rebounded from their defeat to us to end in a respectable second place. The semifinal is played at a neutral venue, in this case Mindoo Philip Park in Saint Lucia, and we have been drawn against Club Sando. Weirdly, we played these guys in a pre-tournament friendly in a game that ended 0-0 at home in Grenada but I am expecting a much tougher assignment this time around. They finished second in the Trinidad & Tobago top division last season but, despite their growing reputation, have never actually won the top division trophy in their history. Their squad is indeed pretty good but not super amazing. They have a few Trinidadian internationals amongst their ranks, the best being right fullback Shannon Gomez, but they are also suffering with a fair few injuries. The most significant of which is to their main forward Junior Asson, who will definitely miss the upcoming game. They have a few decent newgens including defender Keston Wilson and 18 year old Saint Lucian international winger Germal Greenidge but on the whole are not a team that I am terribly scared of. Do not get me wrong, they are the stronger side by quite a way but looking through what they have I believe we have got a chance, if we play to the best of our ability, of beating them. The other semifinal game sees 2020 winners of this tournament, Puerto Rico FC take on Guyanese side Buxton United. Puerto Rico Fc are one of my most hated clubs as they play their domestic football in the American league system and therefore have a pretty formidable squad, making them yearly favourites to do well in this competition. I will be keeping my fingers crossed for Buxton because who would not want to see a Grenada vs Guyana final in the CFU Club Championship. I am rifling through updates today but I will be back soon hopefully with the result of our semi final clash against Club Sando. Before I get around to that though I have a short duty with Kenya to fulfil as we kickstart our African Cup of Nations qualifying campaign. It is exactly those sorts of weird rules and quirks that made me want to start managing in this part of the world in the first place! Great job getting through to semi-finals! Would you recommend playing in the Caribbean? I get bored of anything less than a 40+ game season (incl. cups and continental) as I quite enjoy having two squads to rotate. When did Africa bring that rule in for their Cup of Nations? The domestic-only thing isn't for the Cup of Nations, only the Championship, a different competition. The Caribbean has been very fun thus far. I have particularly liked seeing my regens turn out on the national stage. It is definitely true that the league season can become a bit dull, especially due to the short length and the fact that we are now dominating. Some of the larger Caribbean nations (Trinidad & Jamaica) have a more substantial league system whilst some of the central American nations (Costa Rica) also look pretty fun. As allezdae stated, that rule does not apply for Cup of Nations. It is exclusively used for the other national competition (the African Championship of Nations) which runs on alternate years to the Cup of Nations... very confusing.